This modification allows the driver or passenger to enter navigation information such as destination or other points of interest anytime, whether or not the vehicle is moving. 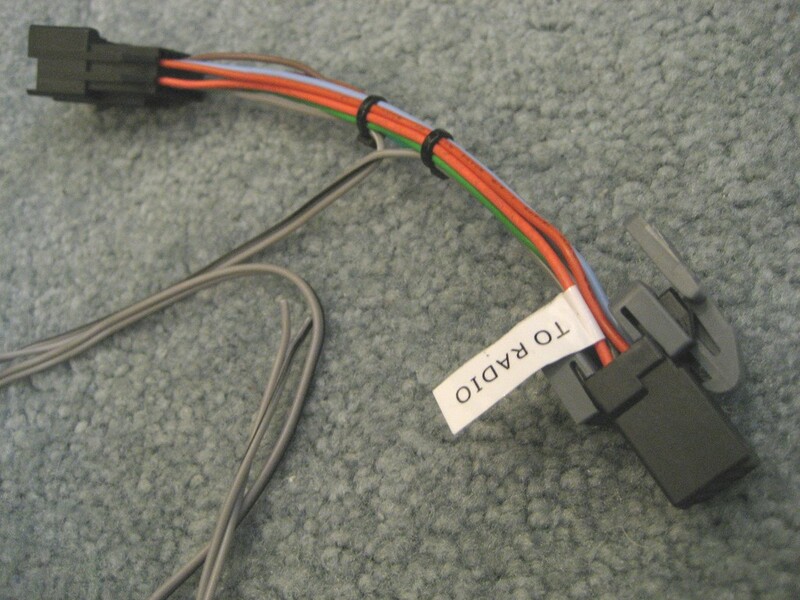 Alternative 2: Connect the new switch into the wiring harness using Delphi connectors and terminals, which allows the installation without cutting into the factory wiring harness. 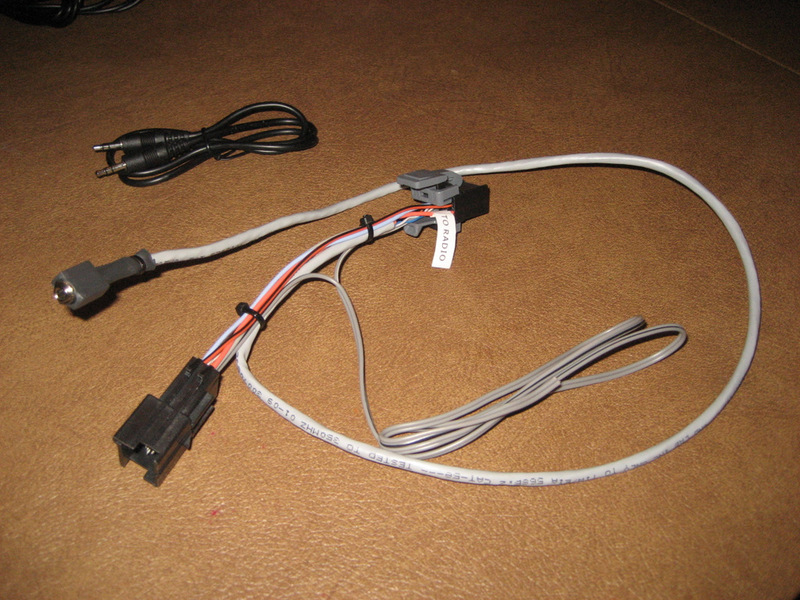 Alternative 3: Connect the new switch using a custom adapter harness this is simply plugged in. 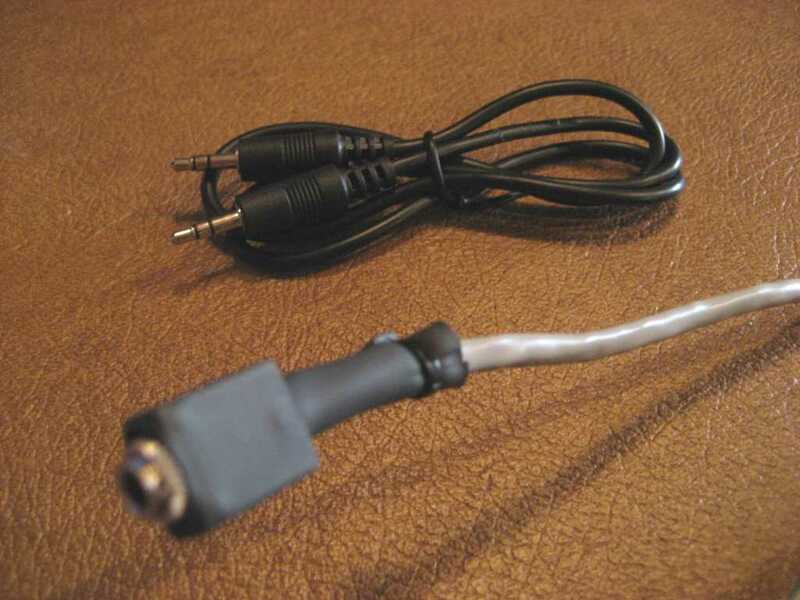 Alternative 4: Same as Alternative 3, but adding an Auxiliary Input jack for connection of music devices. Alternative 5: Install Ben Stanley's Sunset Orange Creations Navigation Commander. 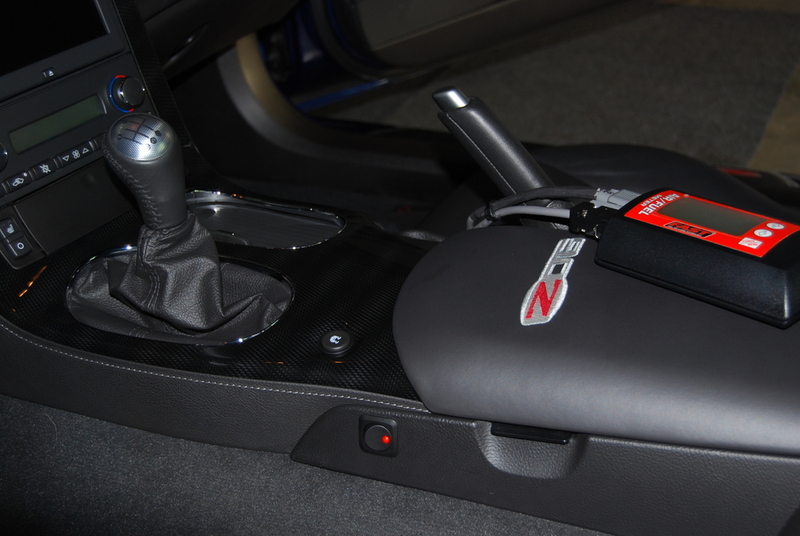 These first photos are from the installation in my Z06. See the switch next to the ash tray? Here's the end result - it's only a $3 switch from Radio Shack. In the switch position shown, the Navigation unit works the same as straight from the factory. If you switch to the other position, you can enter destinations into the nav unit at any speed. Once entered, you must switch back to get the nav unit to track your position. 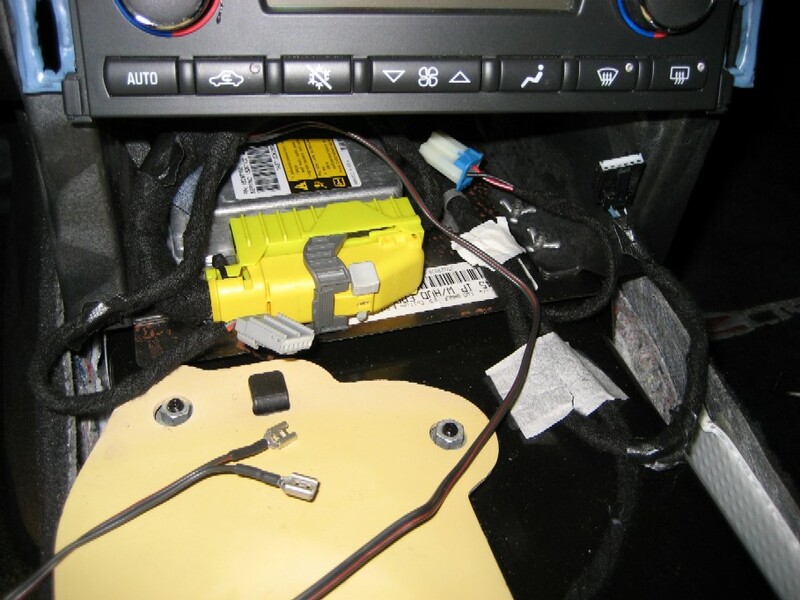 The photo above was taken when I first installed the switch on my '07 Z06. I later installed the newer style '08 console. Photos further below are in my buddy's LT3 coupe with automatic and Selective Ride Control. 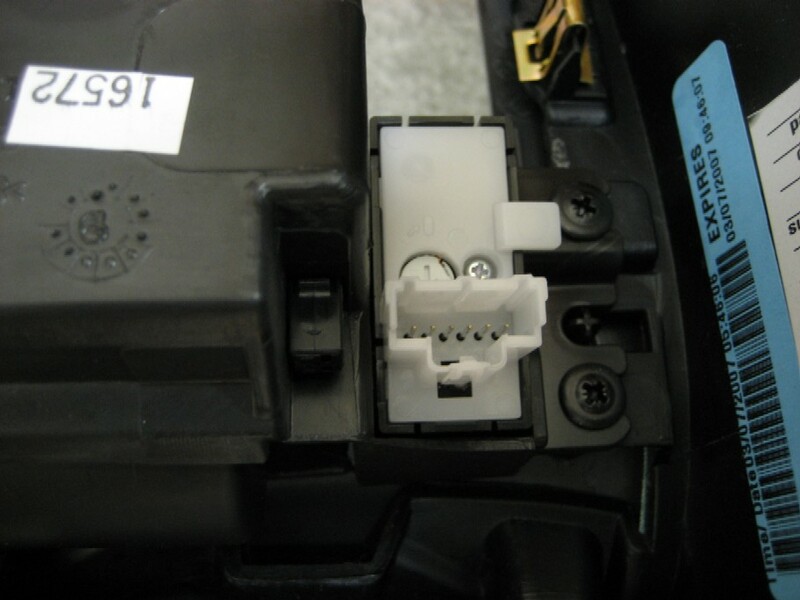 The Denso manufactured nav unit has a number of connectors plugged into the back of the unit. but it also allows the nav unit to remove the various destination displays once the vehicle is moving about 3-4 mph. 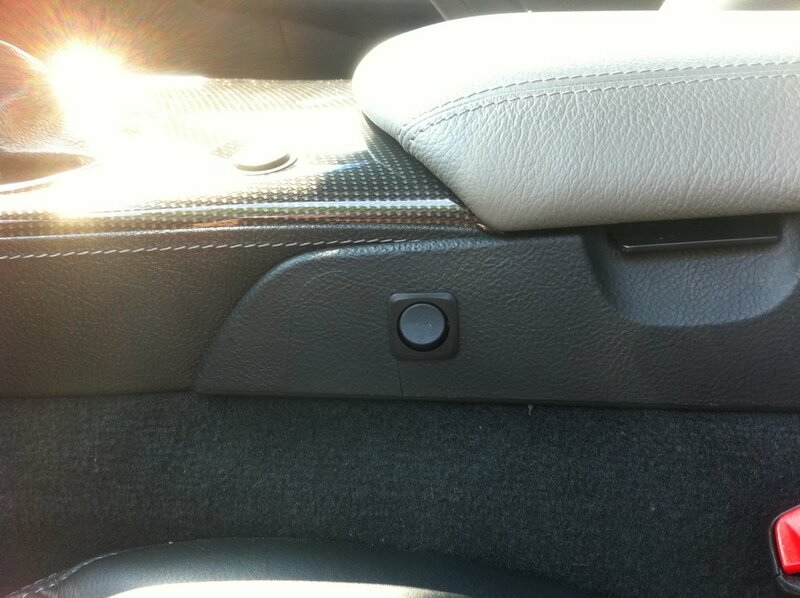 This feature is installed for safety reasons so the driver can't be fiddling with destinations while he or she is driving. But if there is a passenger, why not let him or her input destinations while you are traveling? Removing the speed sensor signal tricks the nav unit into thinking you are stopped, so you can input destinations at any speed. Removal of this signal also prevents the nav unit from tracking, so you must put the signal back after you enter your new destination. 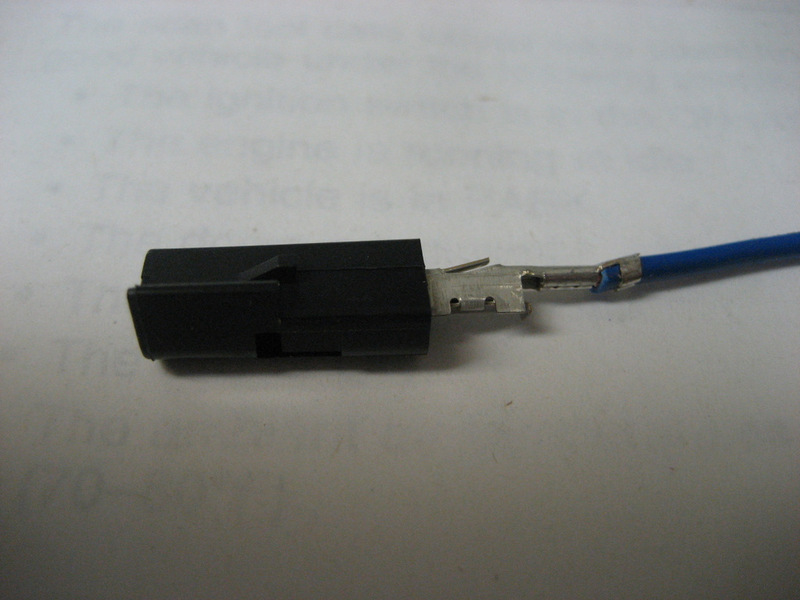 So the simple solution is to cut the wire to the 817 circuit and splice in a switch. Follow along to see how to do it. Here's the back of the nav unit. 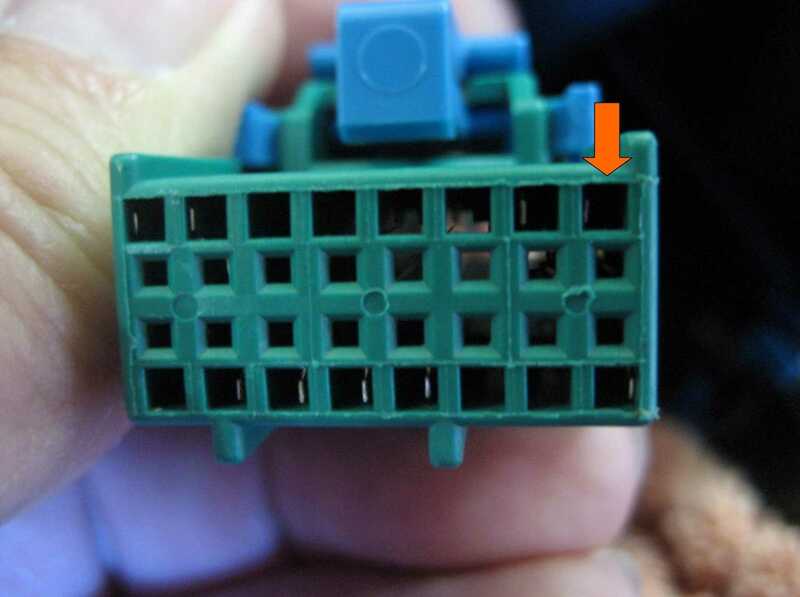 The plug on the right (Connector C2) is the one we want to get to. 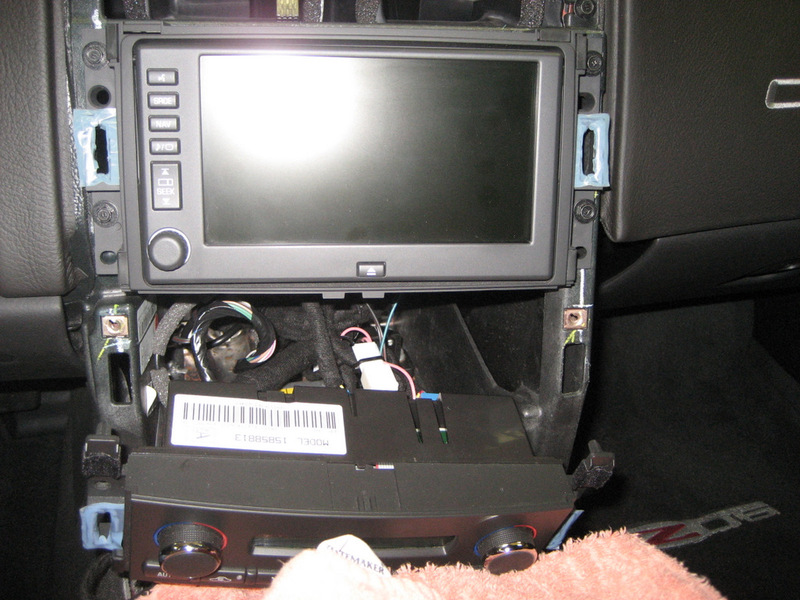 Here is the nav unit and the heating controls sitting in place after the trim panel is removed. To get to this stage, you'll need a couple of Torx screwdrivers and a 7mm nutdriver. 1. 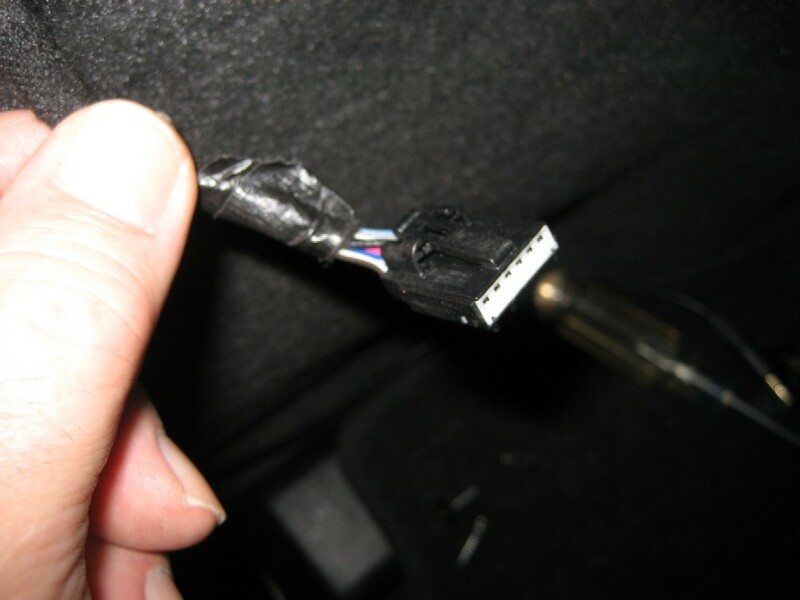 Open your console cover (lid) and remove the cover with a T15 Torx driver (4 small screws). 2. 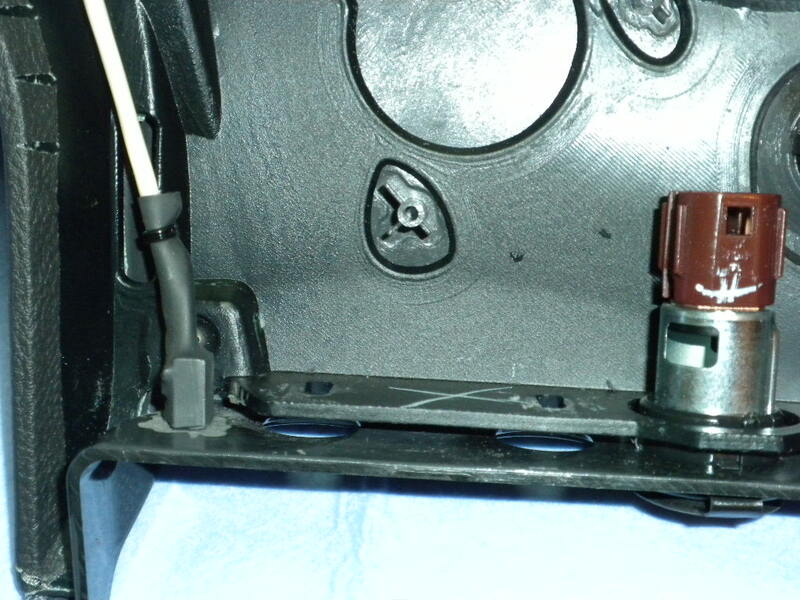 Pull down the emergency brake boot in the front and it will reveal two 7mm screws holding the side trim plate on. 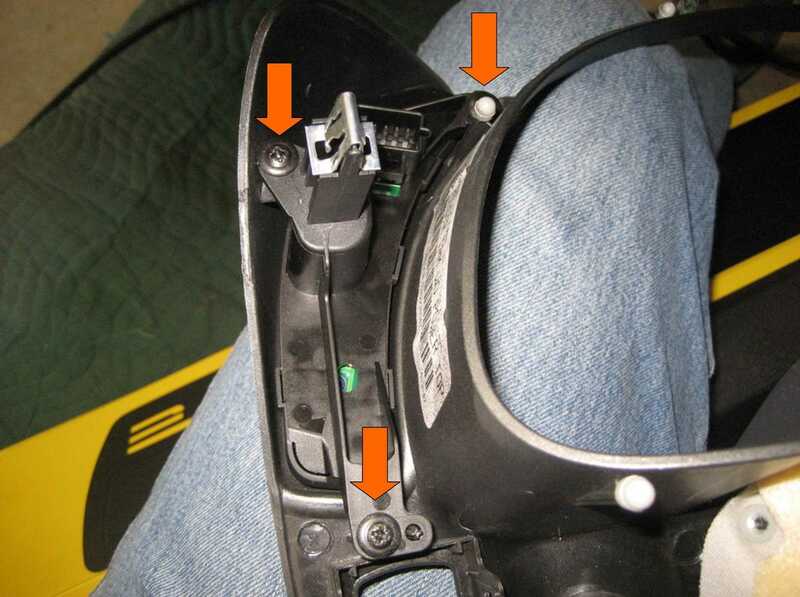 Remove the two screws and pull down the side trim plate away from the dashboard. 2. 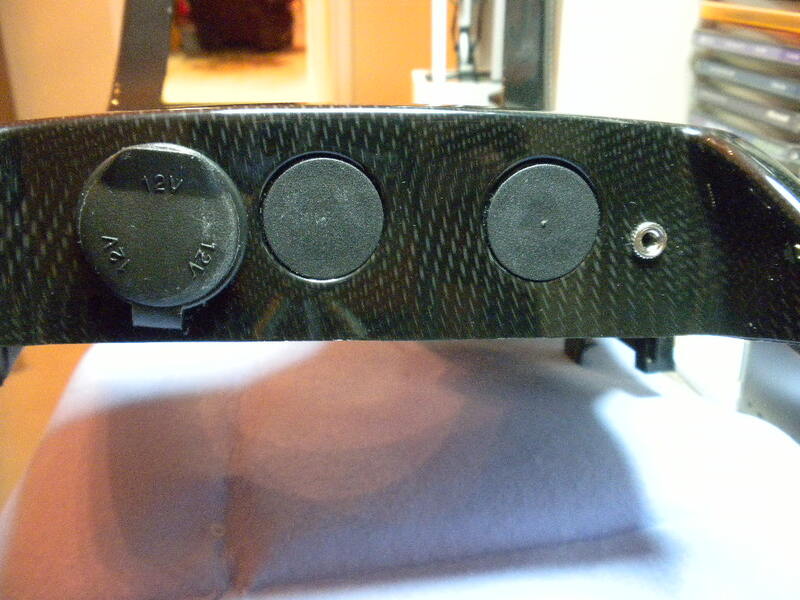 Lift up on the back of the small trim plate (tombstone shaped) where the switch will be mounted (see 1st photo). 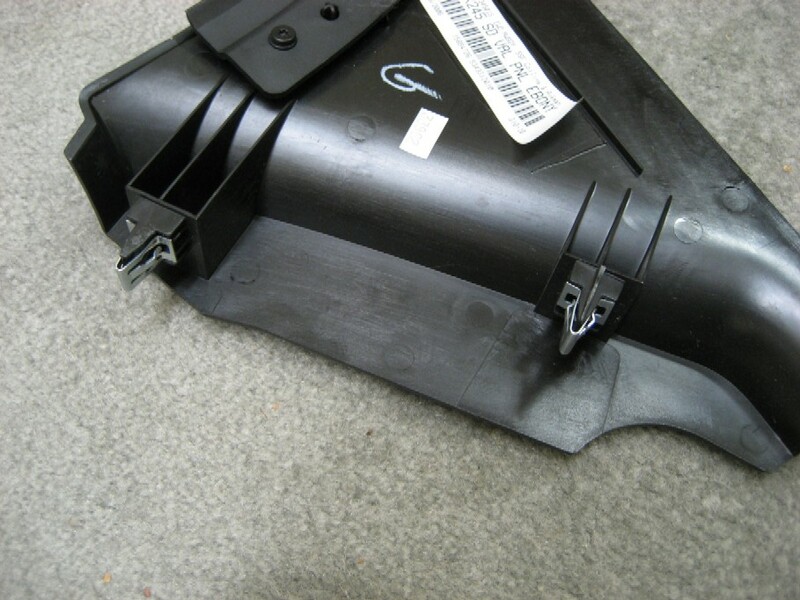 This plate is held in with two snap fasteners, so just lift firmly at the rear and it will come loose. 3. 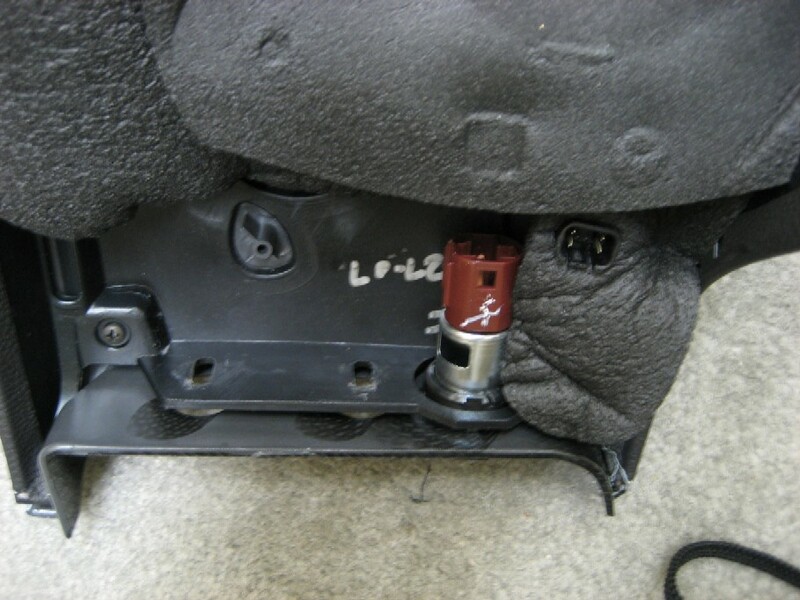 Push down on the leather shifter cover to expose the T-25 Torx screw holding the shift knob in place. 4. 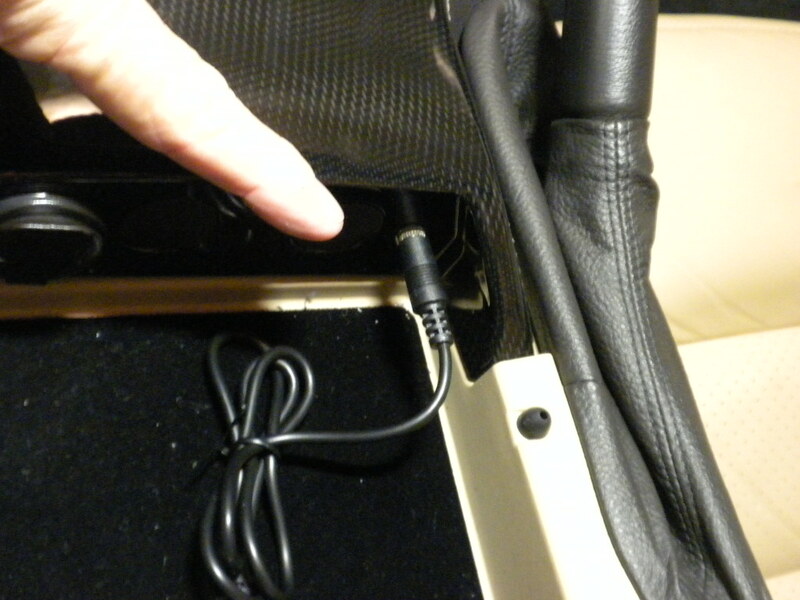 Remove the two screws at the rear of the trim panel inside the console using a 7 mm nut driver. 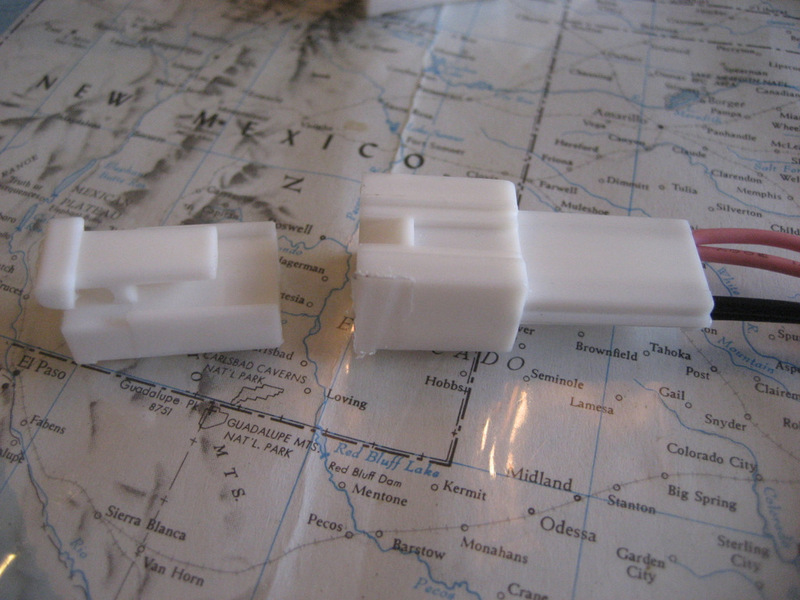 that there are also snap fasteners at the front (all six are shown in the blue tape). 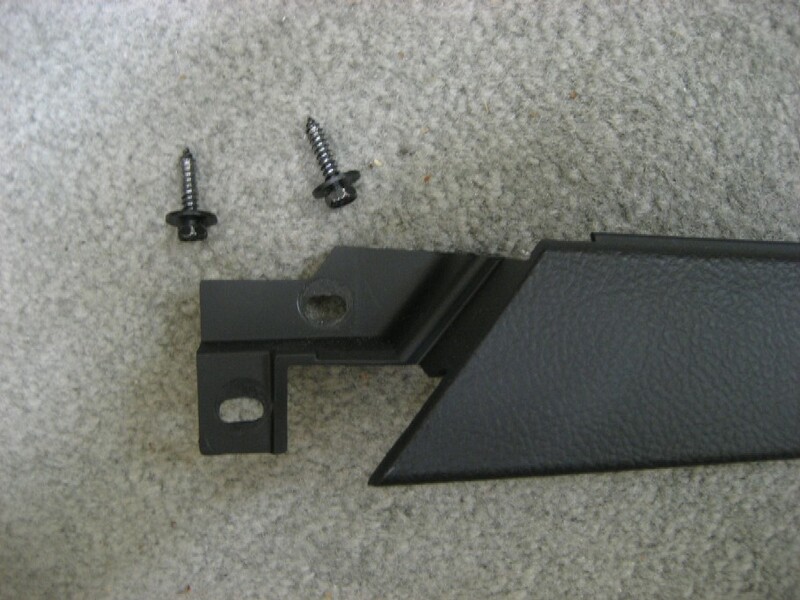 As you lift the panel, these front fasteners will pop out as you lift. 6. Once loose, you will need to disconnect the plugs for the seat heaters (if you have them), the cigar lighter, the traction control switch, and the hazard warning switch. This is necessary to get the trim panel out of the way. I found it easiest to move the shifter into 2nd gear so it will clear the trim panel easiest. 7. 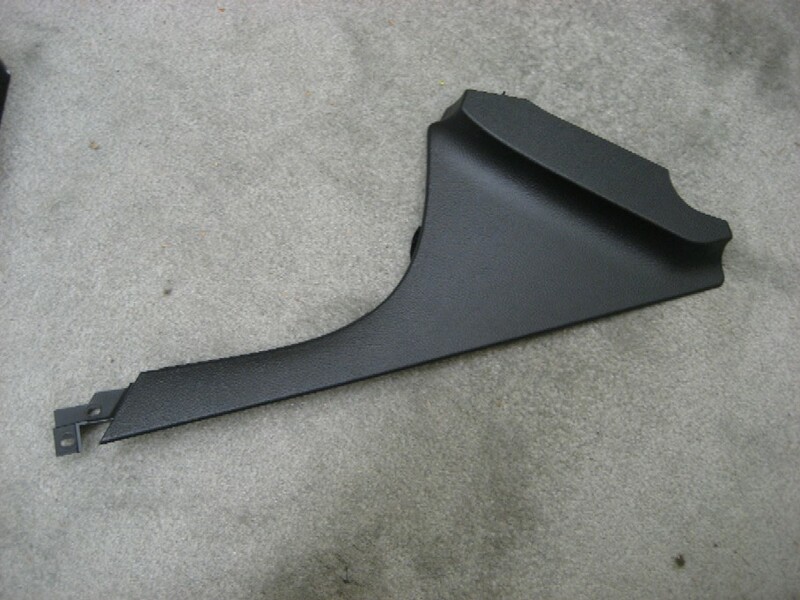 Lay the trim panel on the passenger seat out of the way. Once done, you will see what is in the photo above. 8. Remove the two screws holding the heater controls in place, pull it out a bit, and lay it down. 9. 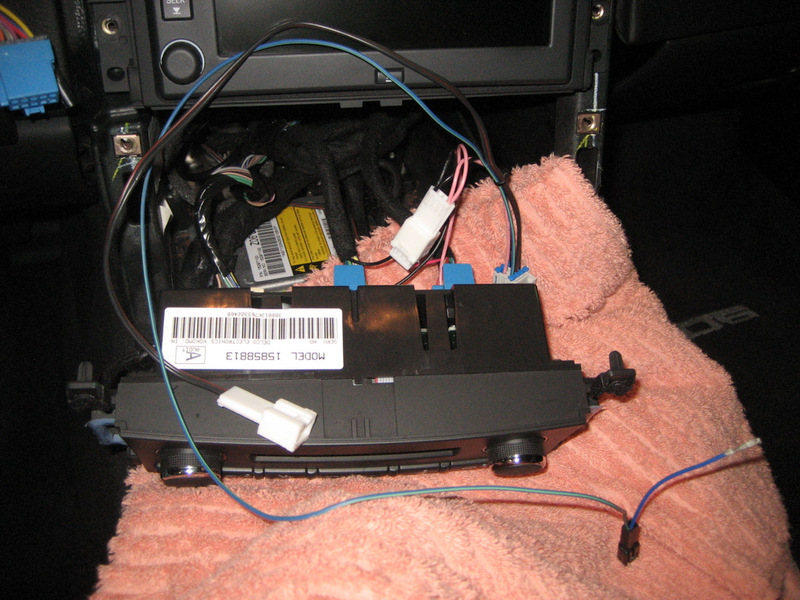 Remove the four screws holding the nav unit in place, and pull it out enough to get to the rear plugs. 10. Press down on the Connector C2 lock and pull it out of the nav unit. Here's a closeup view of the back of Connector C2. The green/white wire on the bottom (Pin D) is the one we want to cut. 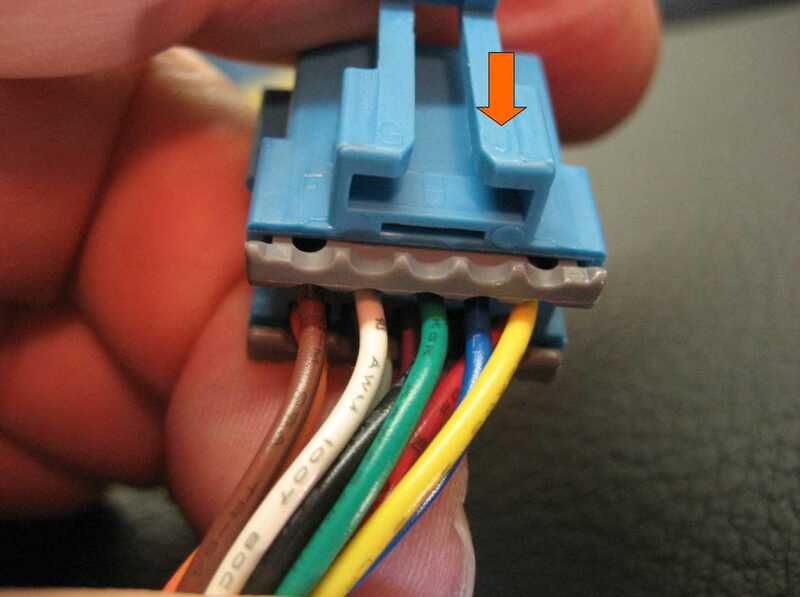 Note that there is another green/white wire in Pin H - do not mistake this wire for the correct one. 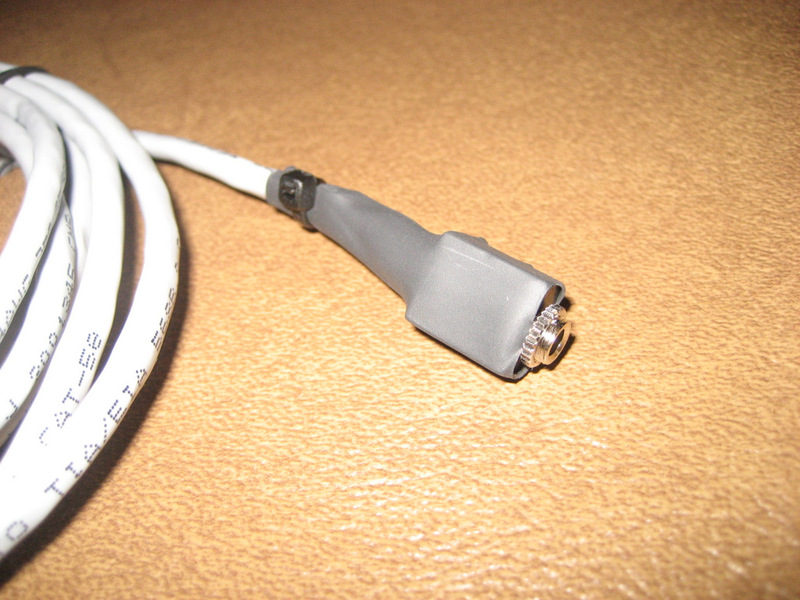 Remove the gray wire keeper at the bottom of the plug to provide easier access to the wire we want. 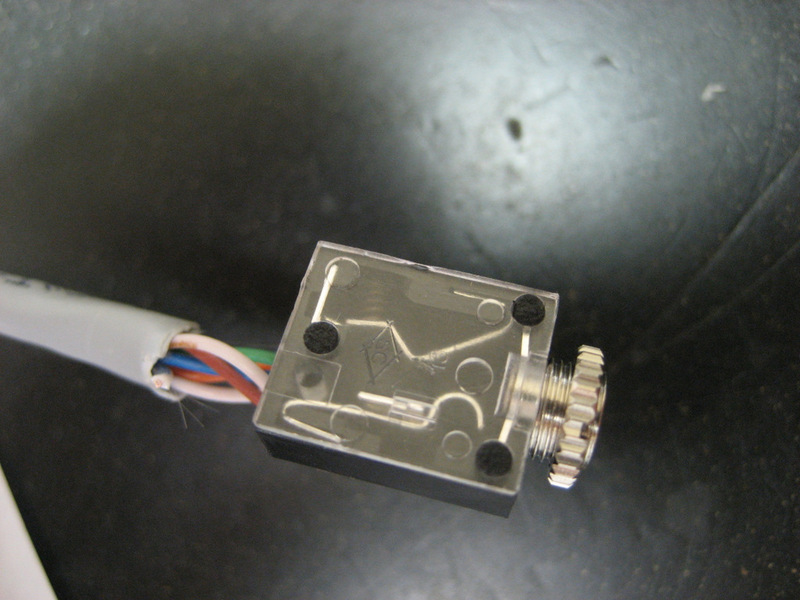 Here's another closeup view of the C2 connector. The green/white wire shown is the one we want to cut. 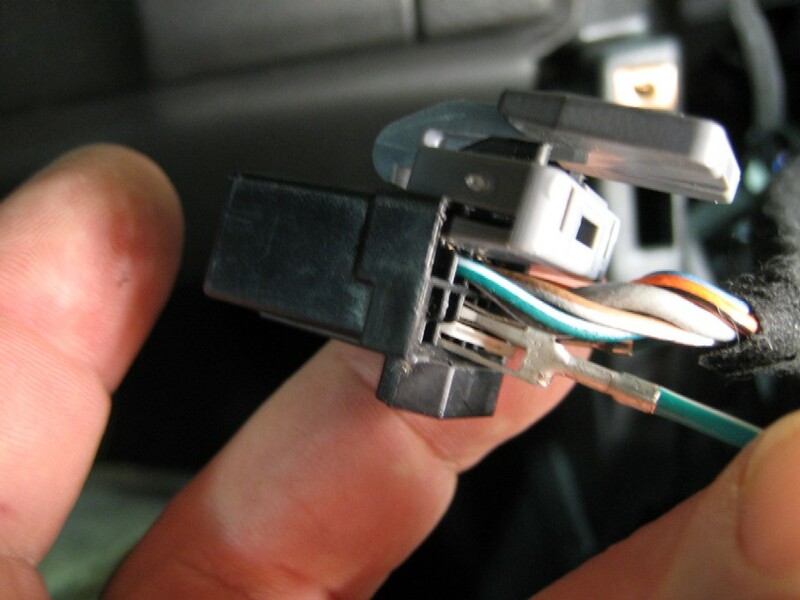 OK, at this point you must decide whether you want to cut this wire or obtain an adapter harness that will allow the installation of the switch without cutting any wires. 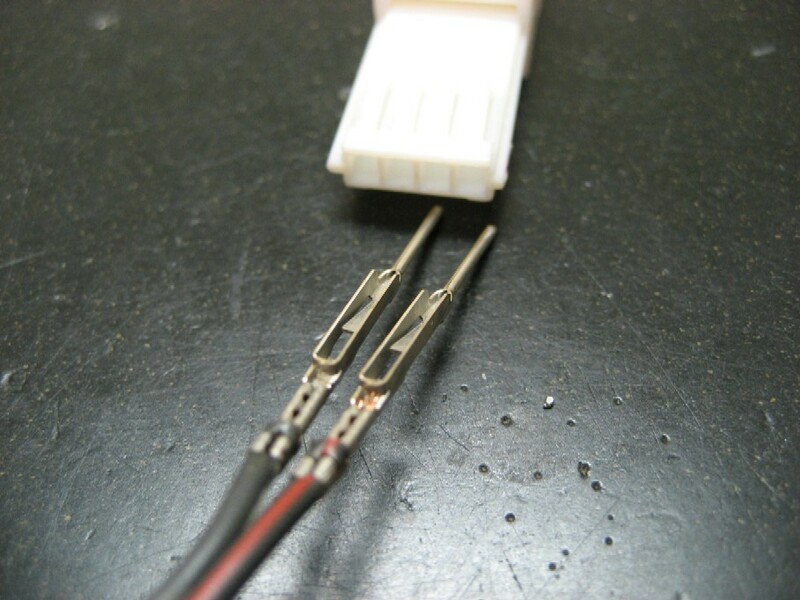 Obtain some two conductor wire (about 3' will do) for splicing into the circuit. I found some 18 gauge speaker wire I had laying around works very well. 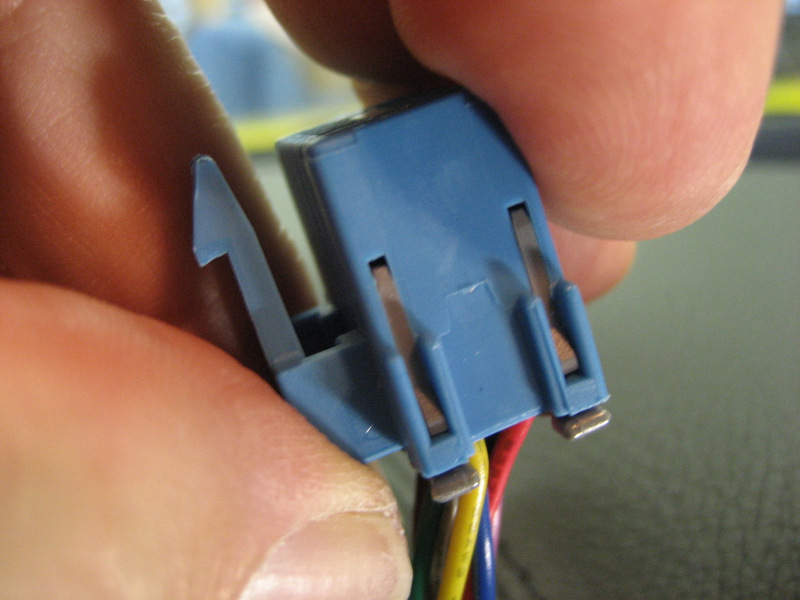 Cut the green/white wire between the plug and the cloth insulation, then solder the two new wires to the ends. 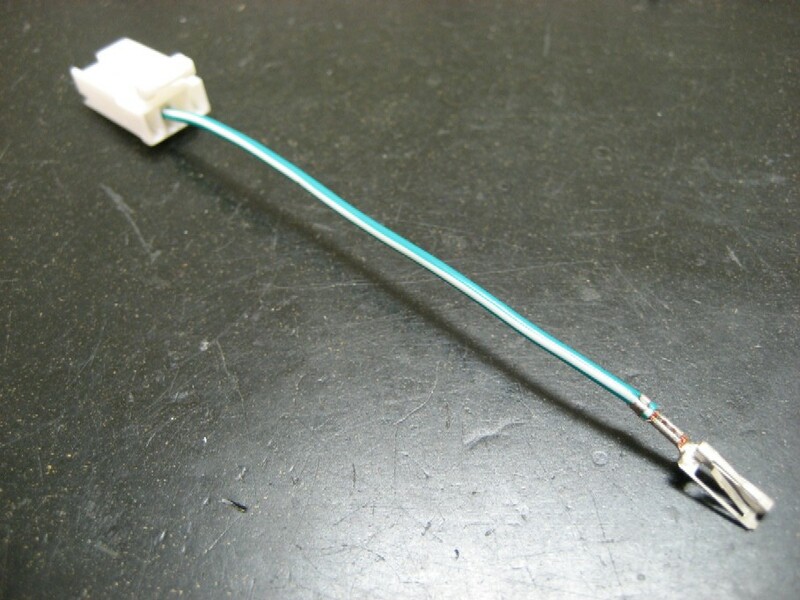 Use heat shrink tubing to insulate the connection. 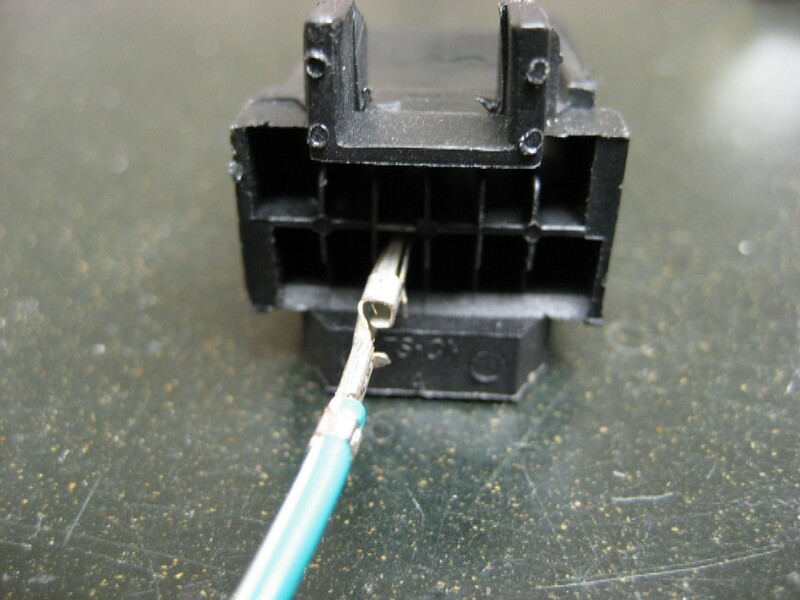 This is the hardest part of the job, because of the care you must take in splicing the wires. 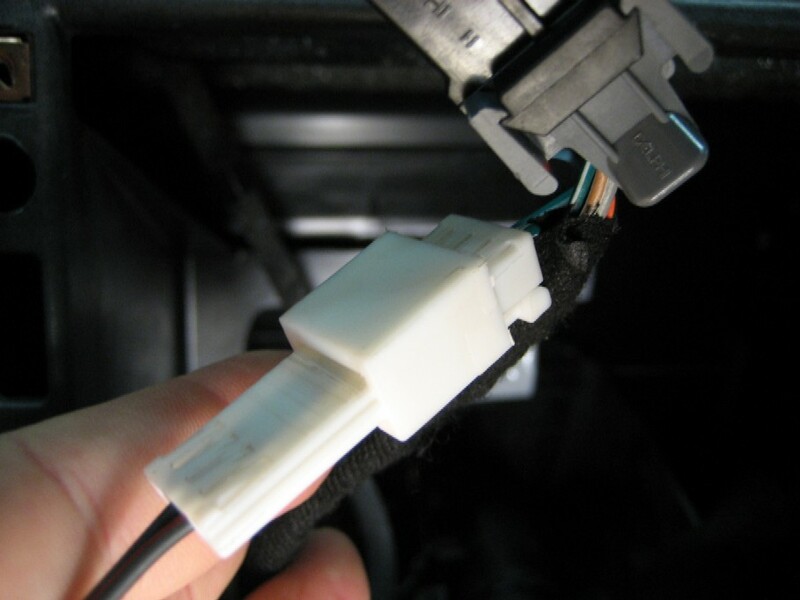 Install a couple of cable ties to prevent accidentally pulling on the spliced connections. Now all of the hard work is done. 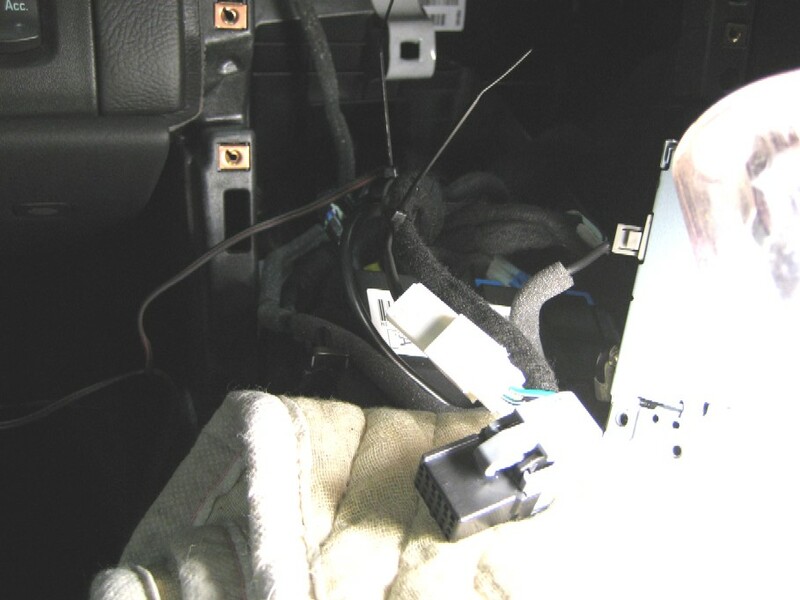 Reinstall the gray wire keeper on Plug C2, then plug it back into the nav unit. 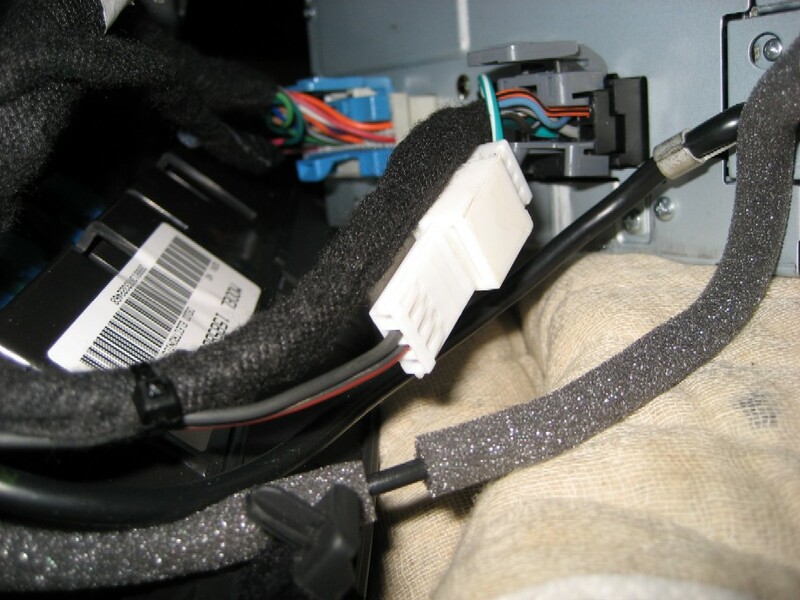 Route your new wire under the nav unit and reinstall the nav unit with the four screws. 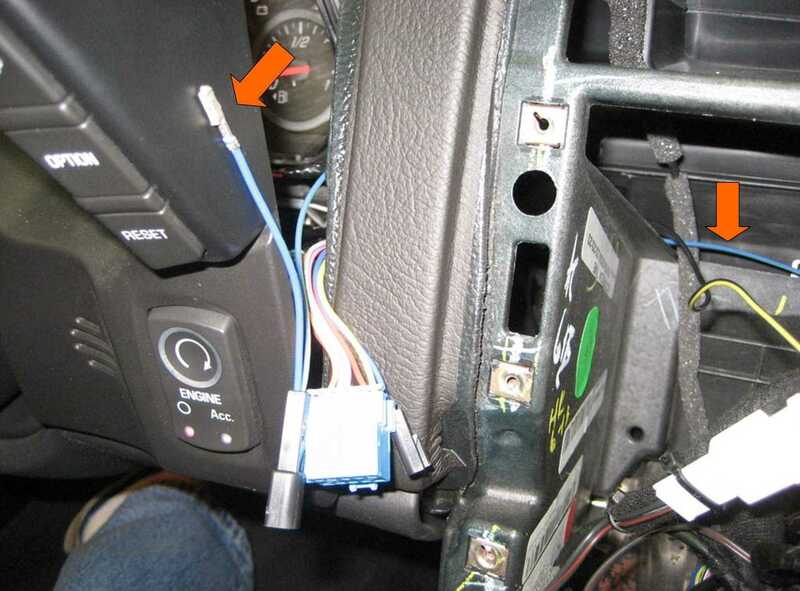 Reinstall the heater control with the two screws. Route the new wire along the console to where the new switch will be. 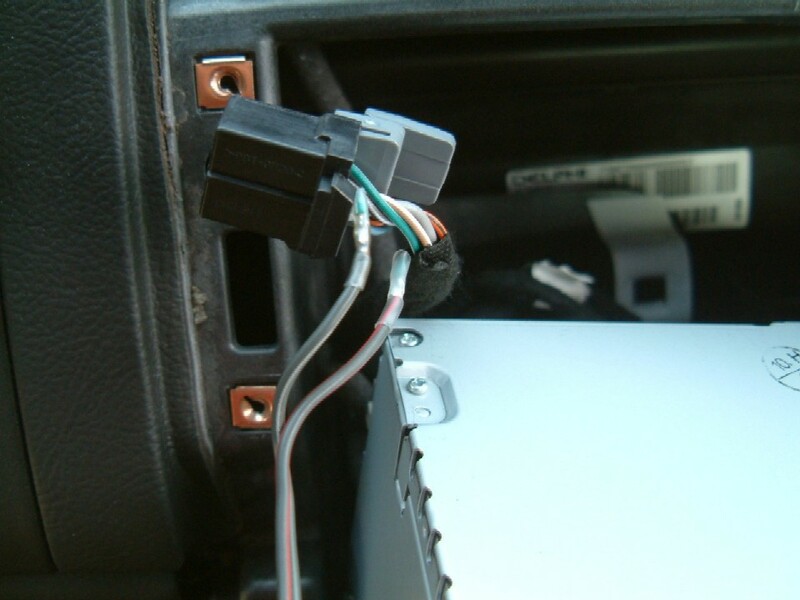 Reinstall the trim panel after reconnecting the plugs you previously removed. 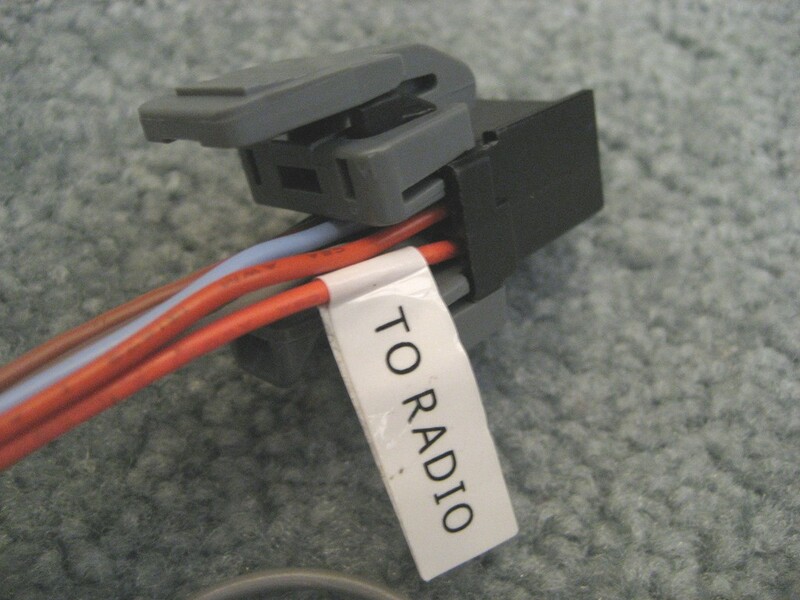 Any small switch will do, but this one from Radio Shack worked great. It mounts in a 3/4" hole drilled in the plastic trim plate. 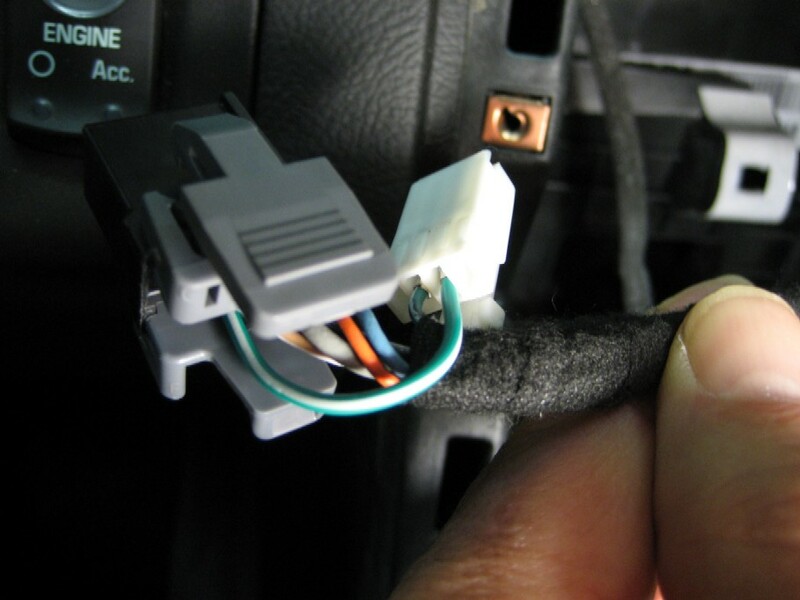 Simply connect the loose ends of the new wire to the switch using push connectors and snap the trim plate back in place. Install the console cover and you're done. 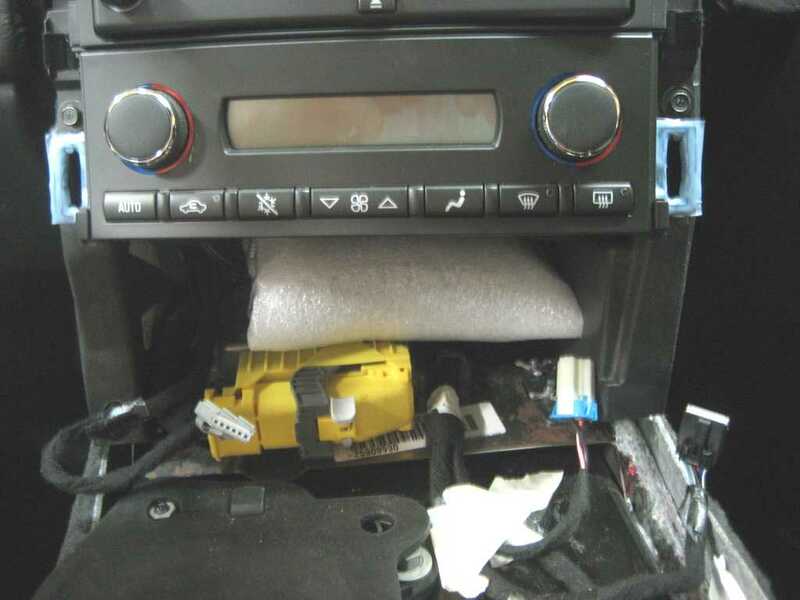 When reinstalling the Nav Unit and the heater controls, before tightening the screws, push up the heater controls as far as possible. There is a bit of play and I found my ashtray would hit (barely) the heater controls, until I raised it ever so slightly. The shot above was taken before I installed a new 2008 console in my Z06. The '08 console does not have the small "tombstone" plate for the F55 suspension where I mounted the switch shown in the previous photos. The new switch I also found at Radio Shack, model number 275-730. Now I have to flip open the ash tray door to use the switch, but it's pretty easy. Note that this appears to be a lighted switch, but remember that this circuit does not provide any power for a switch light. So you might as well buy a nice looking unlighted switch for this modification. 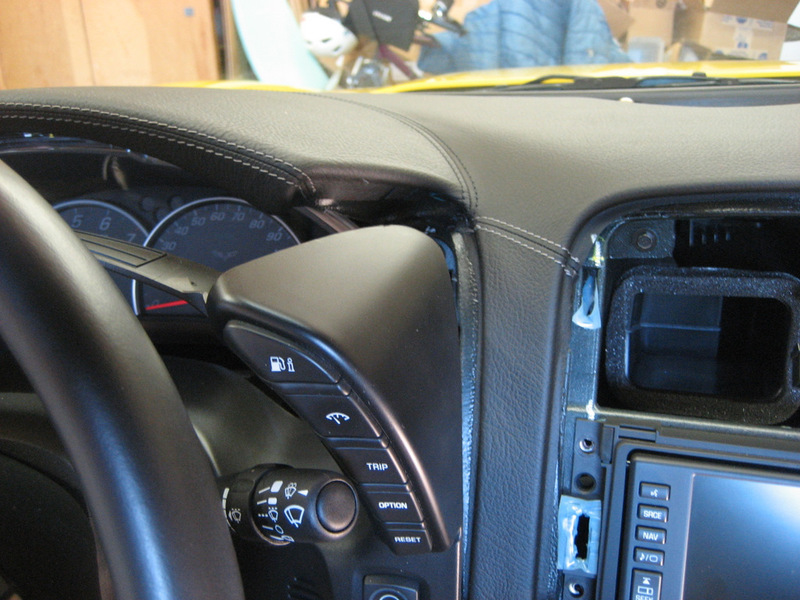 The right side console panel shown above is easily removable. 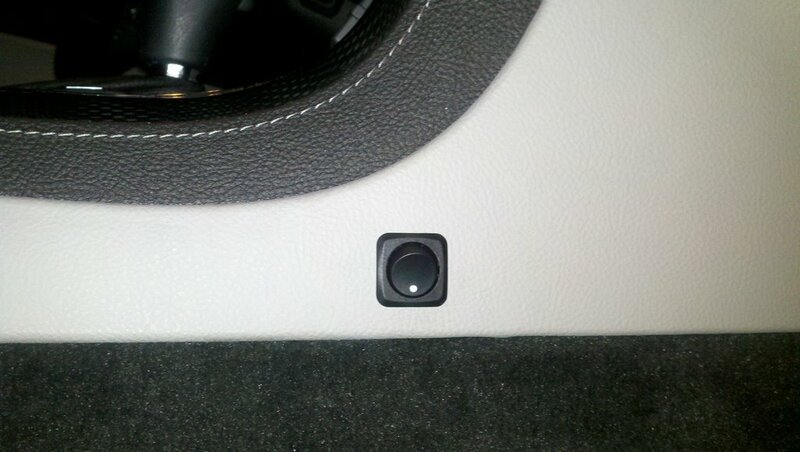 To use the modified nav system, leave the switch in place as shown, except when you want to enter a new destination. 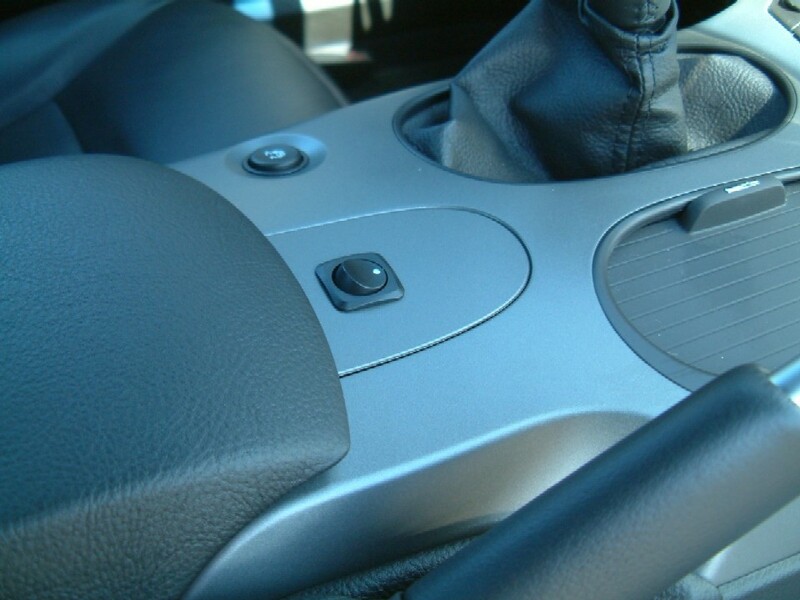 While you are driving, switch to the other position, which removes the speed signal from the nav unit. Your Destination Menu will reappear, and you can input whatever you want. Once you select "Guide" and the nav unit recalculates your route, move the switch to the normal position for tracking. Now that your frustrations are over, enjoy the nav system as it should have been designed!! After a 2000 mile trip, the nav mod works great! But there is one issue to note. before the nav unit resets itself and you lose the Destination Menu. Usually, there is sufficient time to input your data, but occasionally you will have to switch back to "normal" and wait a few seconds for it to blink. Then switch back to the "mod" position and continue entering your data. If you are waiting for a long "list" of points of interest, you may have to switch back to "normal", then "mod", a couple of times. 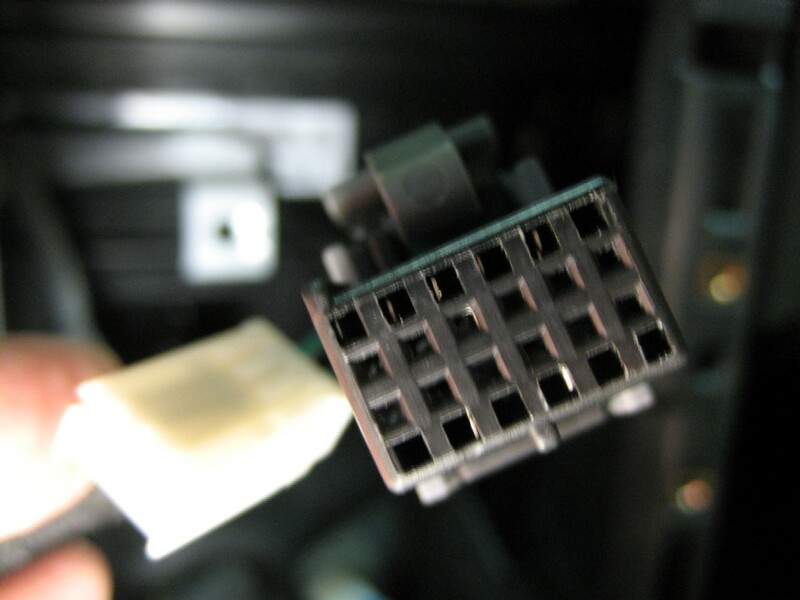 Connect the new switch into the wiring harness using Delphi connectors and terminals, which allows the installation without cutting into the factory wiring harness. 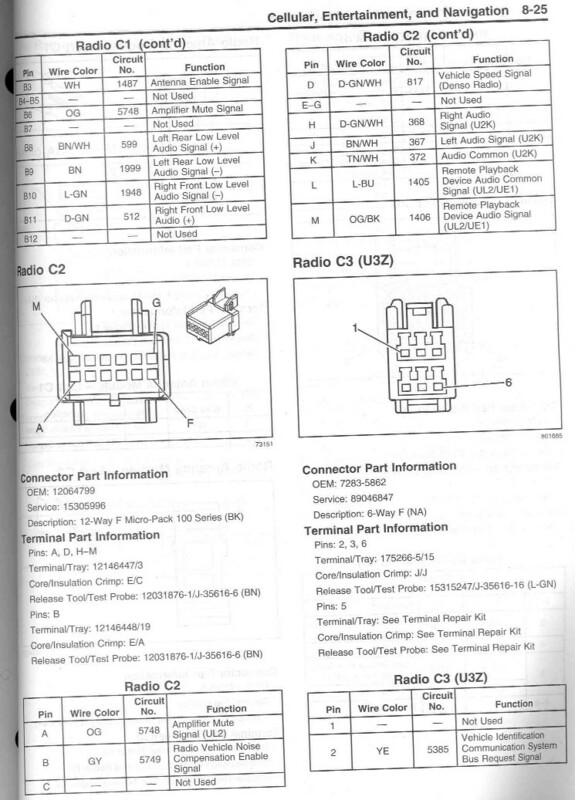 As shown on the page of the Service Manual above, the 12 pin connector is a Delphi 12-way female Micro-Pack 100 connector, part number 12064799. The female terminals are part number 12146447. Note the green/white wire is in position D, the third slot from the left on the bottom. Here's a better closeup of the terminal. 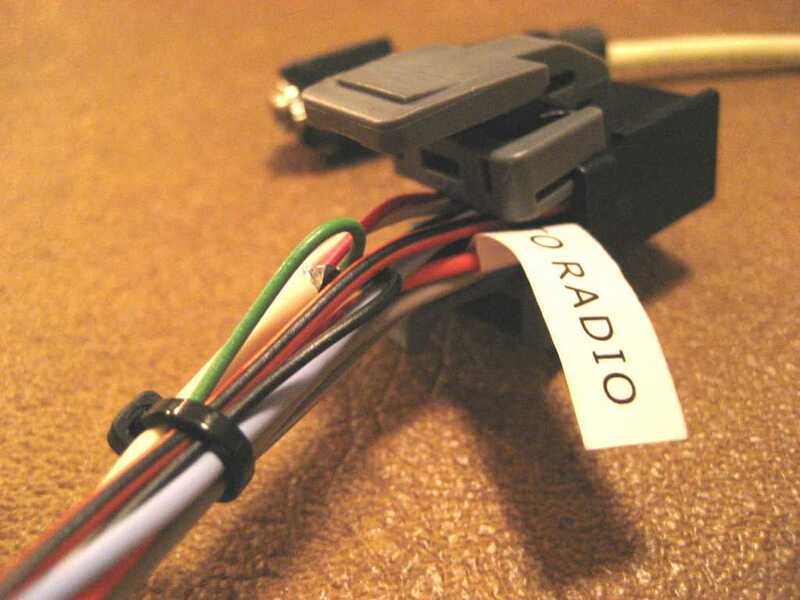 The Delphi Micro-Pack 100 connectors have been used for years in GM radios. 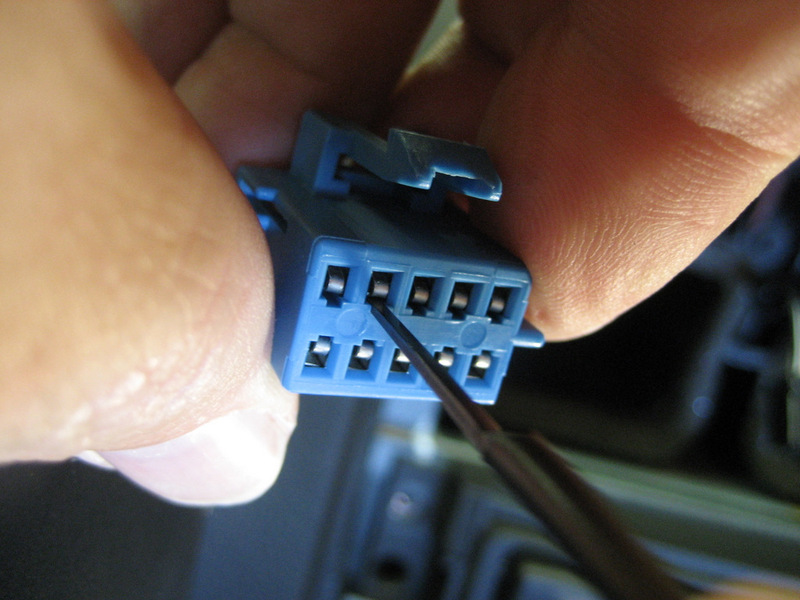 To install a switch in the Pin D (green/white) wire of the 12 pin connector, you must first remove the terminal from the connector. See the locking tab? That needs to be pushed down to release the terminal. The middle 12 holes are where the terminals make their electrical connections. 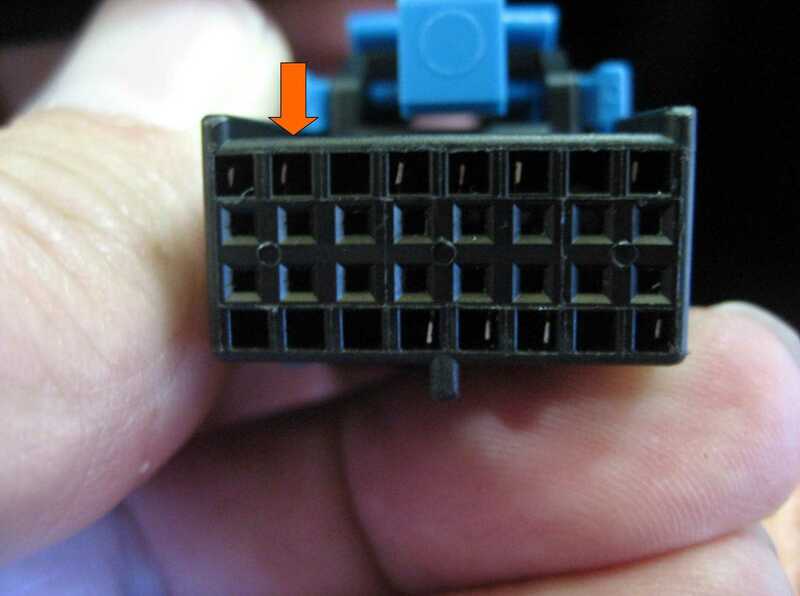 The top and bottom rows are where the locking tabs lock into the connector to prevent them from coming out. you can feel it riding up the ramp of the locking tab. Push down (actually to the right in this photo) and this will release the terminal. 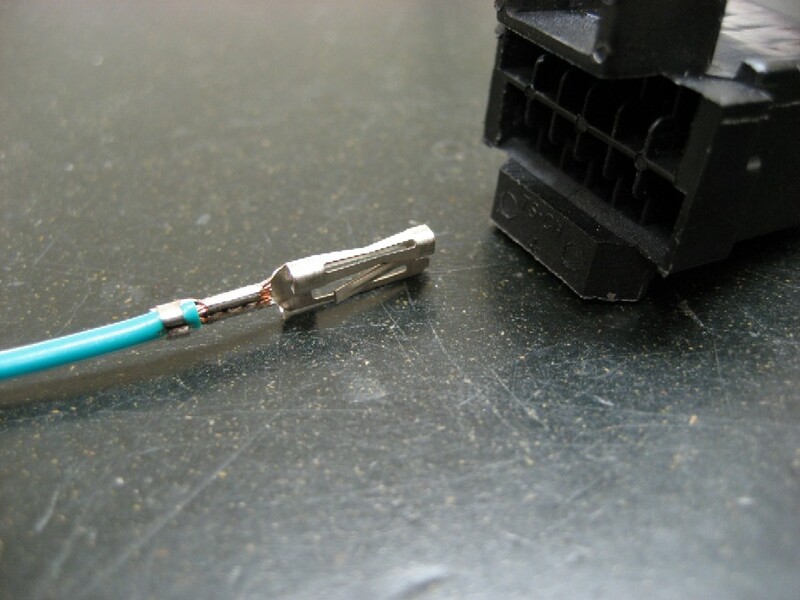 Again, be SURE you have removed the TPA from the back of the connector. Gently pull on the terminal and if you released the tab OK, it will come right out. This is a bit tricky until you get used to the feel of that locking tab. OK, now you need some parts. and two male terminals, part number 12084449. 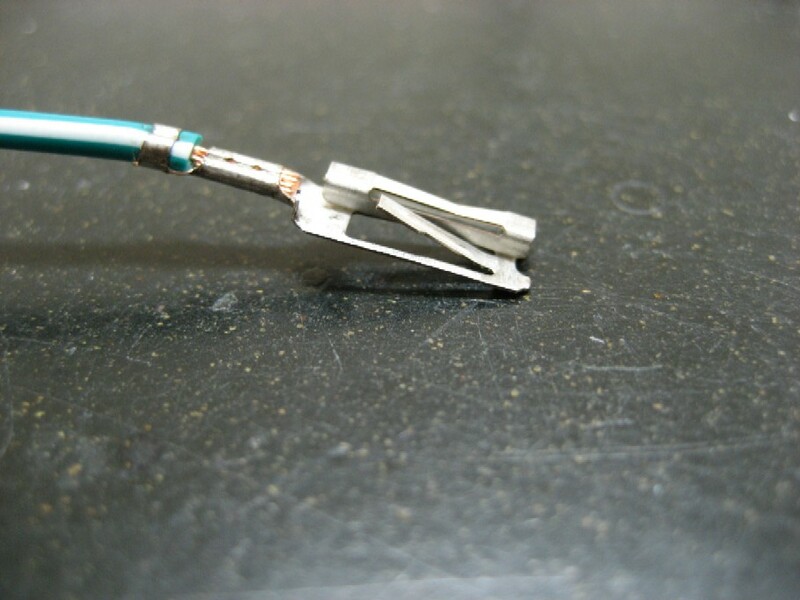 You crimp the two female terminals to a short piece of 18 gauge wire. 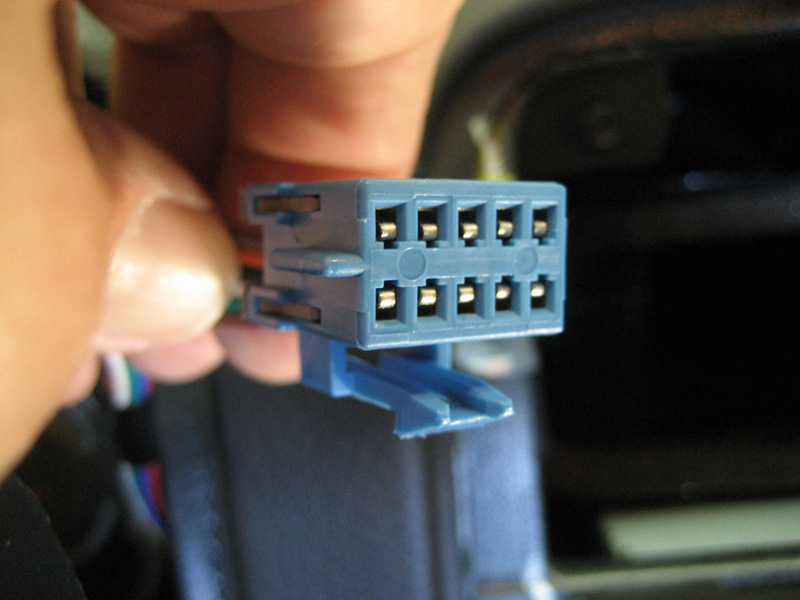 Insert one end into the 4 pin female connector (only the middle two of the 4 positions are used). See the four locking buttons? One of them is up. By pushing down on the locking buttons, this provides a secondary assurance that the terminal will not pull out. and push down the last locking button. See all four locking buttons are pushed down. Now we need a pair of wires for the switch and the mating male connector. Push down all four locking buttons. 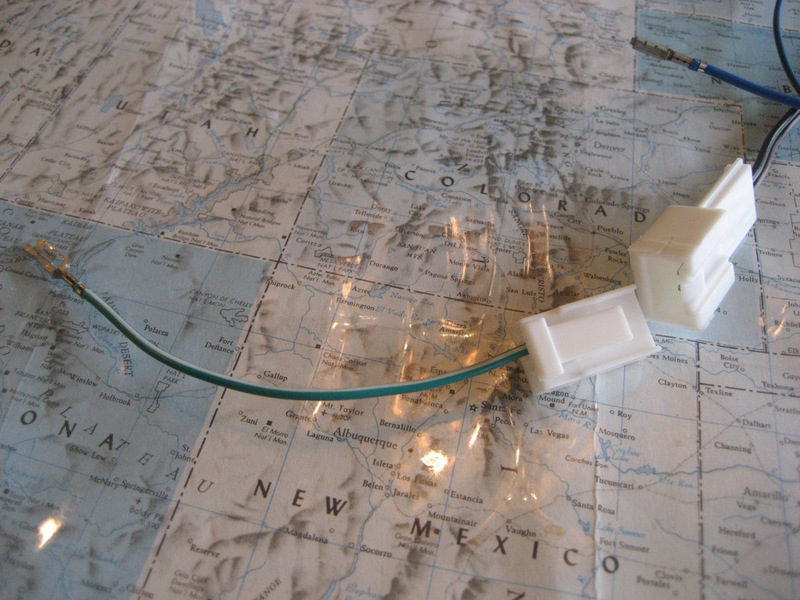 Then run your new switch wires to the location you've chosen for the switch. Reinstall the console and you're done. The hard part of this alternative is finding those Delphi parts. 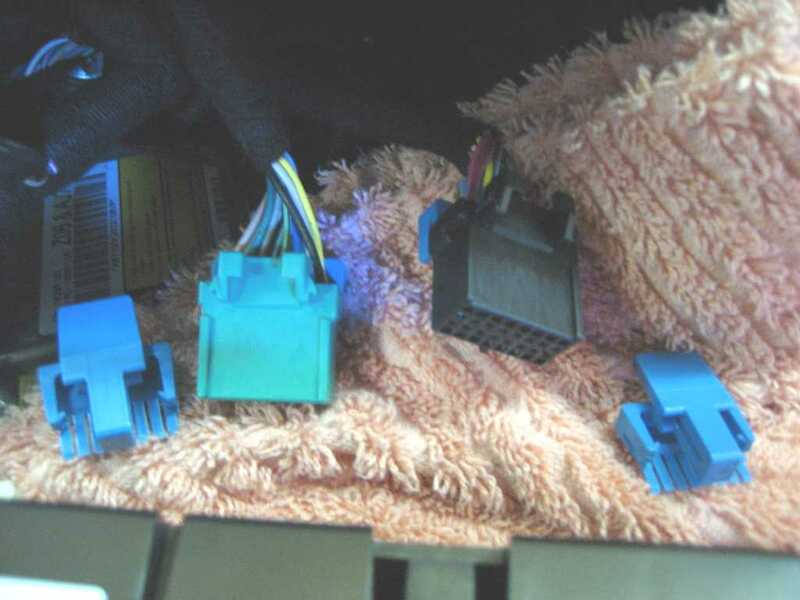 You MIGHT find the terminals at your friendly Chevy dealer, but the connectors are very tough to find, especially the 12040904 female connectors. 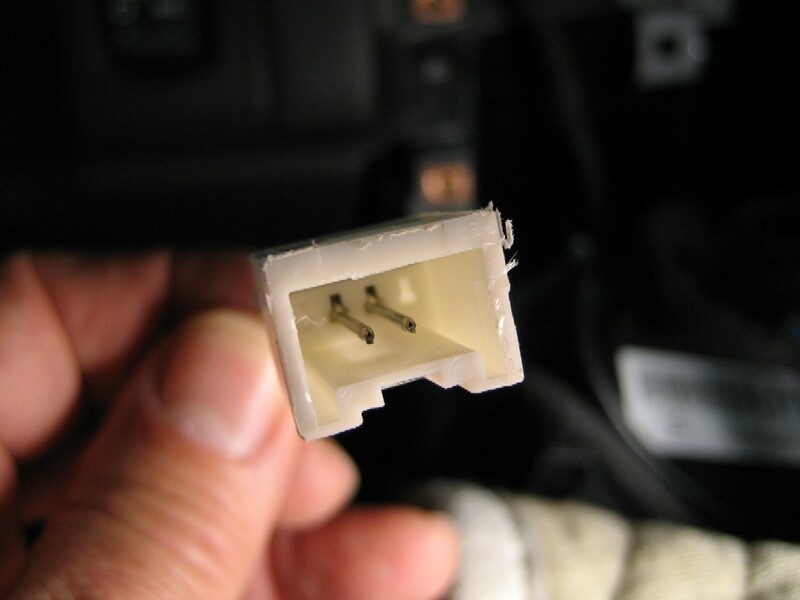 The 12040903 male connector was used in some older Pontiacs, so you might luck out there. 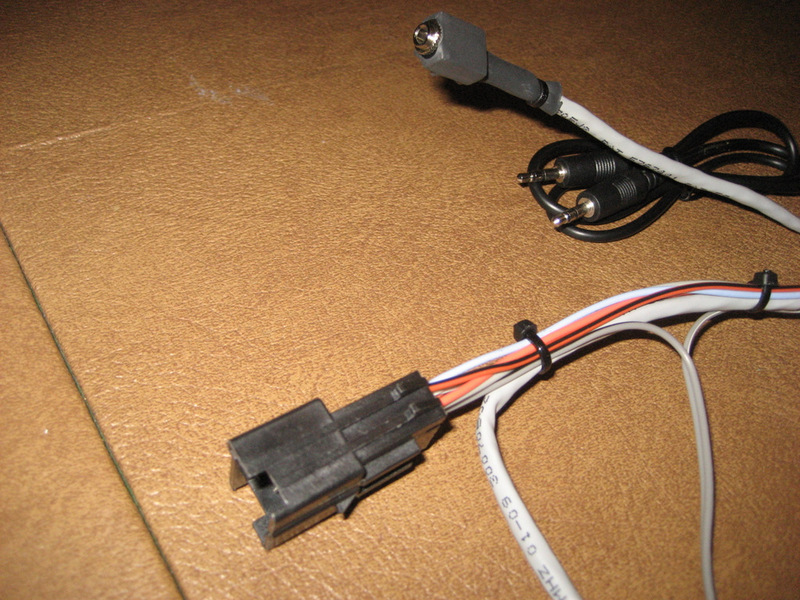 You have the information to build your own adapter harness, but if you want one already made up from me, send me $25 (Paypal or a check) and your address and I'll get one coming to you. 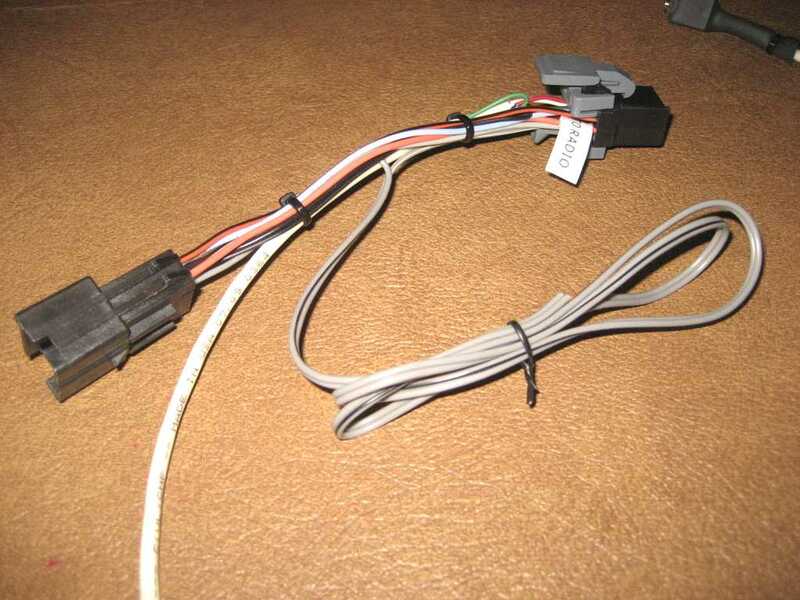 This NAV-1harness will include both connectors, the double ended female wire to connect back into your 12 pin plug, and a 2' switch wire to connect to the your switch. 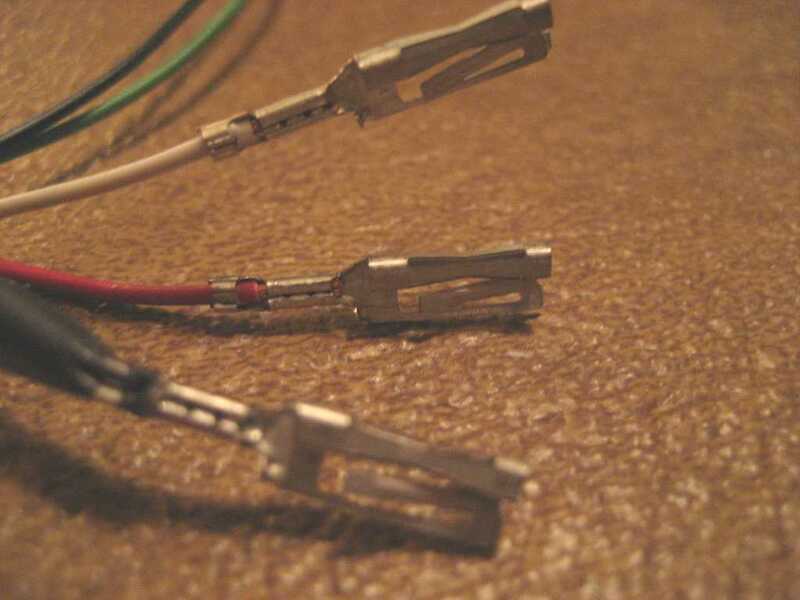 The terminals will all be crimped to fit the connectors. 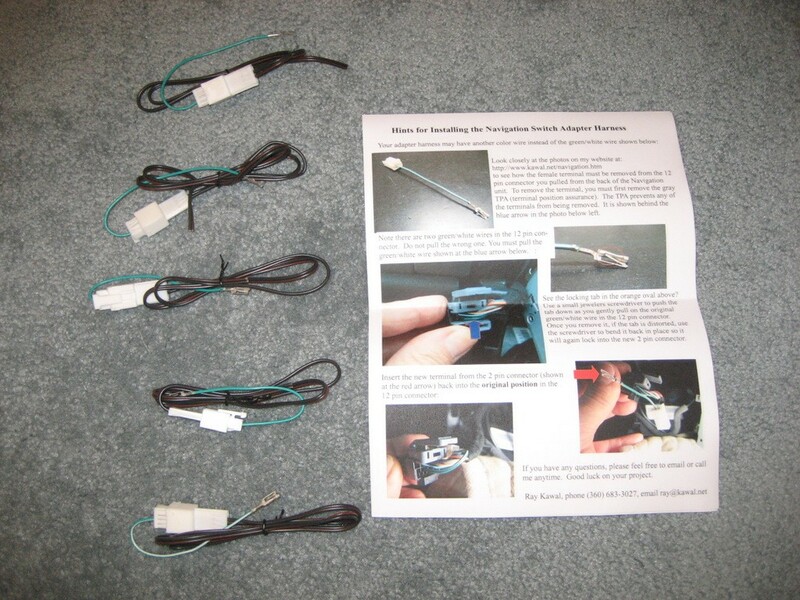 The switch and switch terminals are not included, because each of you might have a different idea of what kind of switch you want and where you want to mount it. Email me at ray@kawal.net if you have questions. also wanted the mod, so we put it in his Vette today. You could also mount the switch on the side of the console in the white area above. The following photos will help you with this modification. Removal of the console would be a five minute job if it wasn't for those pesky switch connectors. Once you get them off, the console comes right out. See the little square hole in the brown part? That is sometimes facing down (as shown) or sometimes up, if your unlucky. But the locking tab is in that square hole. 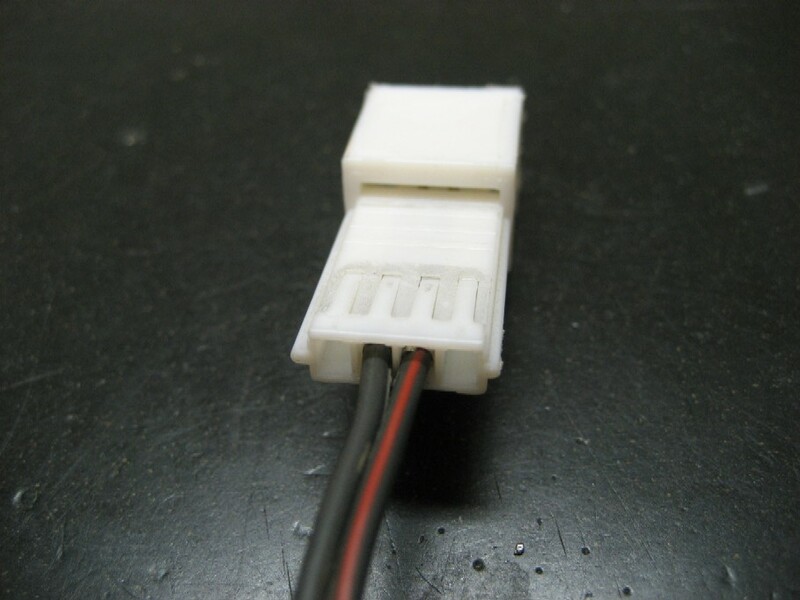 You need to get a small tool to push in on the tab and once released, the connector will come right out. 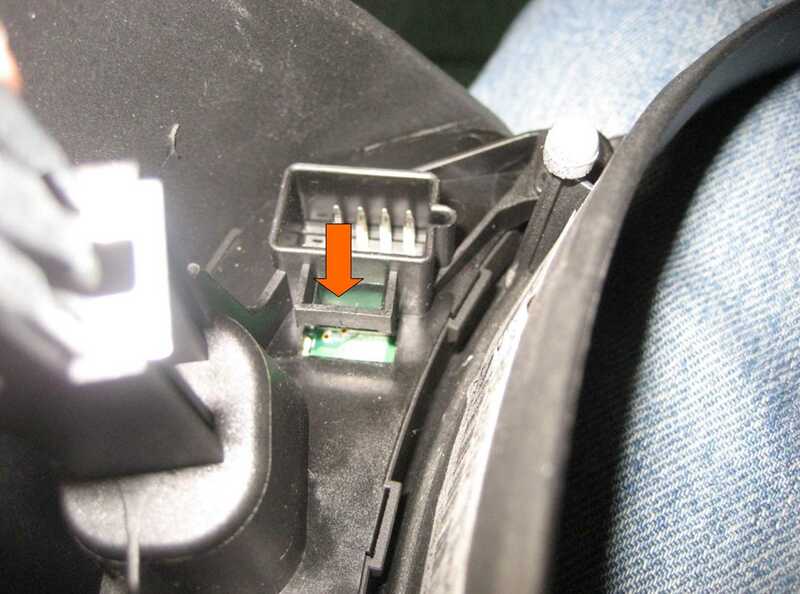 Remember, there are two of these connectors - one in the console and one next to the ashtray. You only need to remove this if you are going to use this location for your switch. 1. 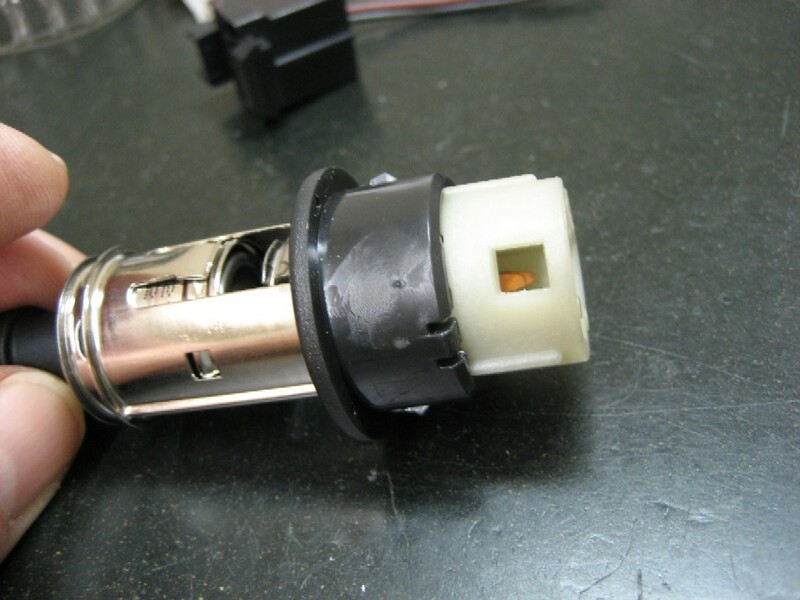 See the black plastic ring on the connector/lighter assembly? When it is locked in place, this ring is slid all the way to the left in this photo, along the chrome metal tube that the lighter plugs into. 2. 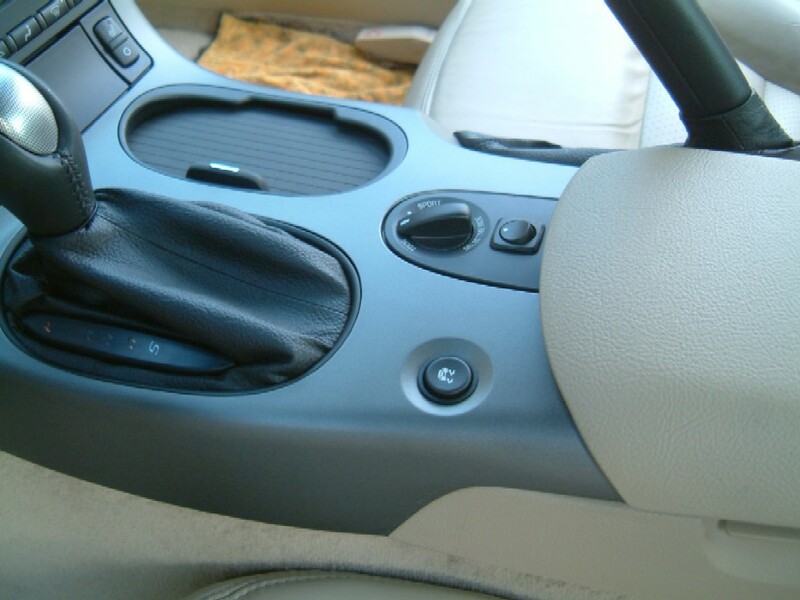 To remove it from the ashtray, you must be able to press in the two black locking tabs seen at the top and bottom of the black ring. This allows it to be released from the hole in the ashtray. But those locking tabs cannot be pushed in until the black plastic ring is slid along the tube to the position shown in the photo. A. See the square hole to the right of my thumb in the photo? Now look to the right at the plastic ring and you will see the locking tab that locks into that hole. There are two of these holes and locking tabs (unfortunately), one is on the other side that you can't see in the photo. B. This is tricky, but if you remove the lighter and look down inside the tube from the front, you will see the two square holes with the locking tabs in them. C. You must push both locking tabs out of the square holes, while you push the tube from behind. The black plastic ring will stay in place on the ashtray while the tube will come out the front. Without the proper tool, I used two small jewelers screwdrivers to push hard on both locking tabs while pushing the tube out the front. You need about six hands to do this, but with a little luck, patience, and swearing, the tube will pop out the front. 4. Once you get the plastic ring slid down the tube into the position shown, you should be able to pull the entire lighter assembly, including the black plastic ring, out of the ashtray assembly. This is because the two other locking tabs shown at the top and bottom of the plastic ring will collapse when the ring is in this position. 5. 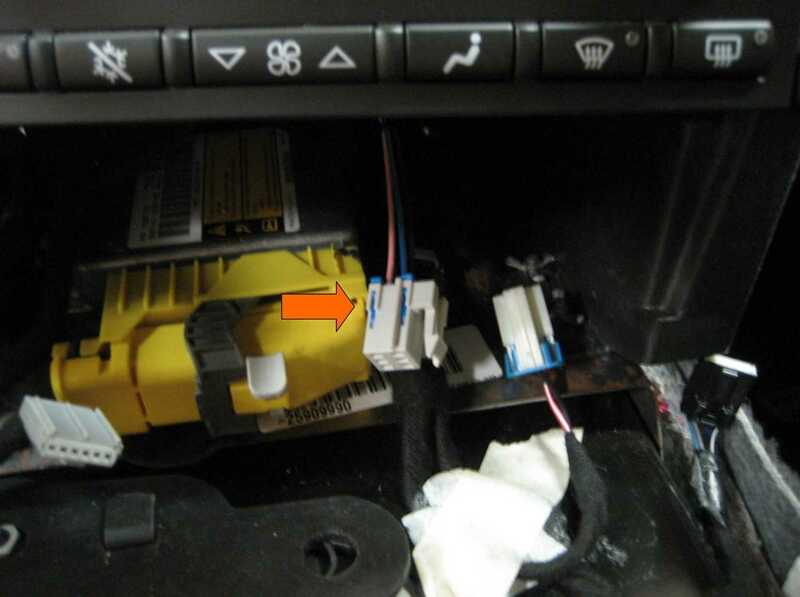 If you ever need to install the lighter/power connector back into the ashtray or console or whatever you are mounting it to, it is really simple. You just push the plastic ring into the hole and push the tube into the ring. So you can see how simple and quick that would be at the factory. But getting it out is another matter. There is probably a tool that allows you to push the tabs in the square hole and lock the tool into those same holes and pull the entire assembly out. Maybe your local auto parts store might such a tool, but it is probably too expensive to buy for a one time job. 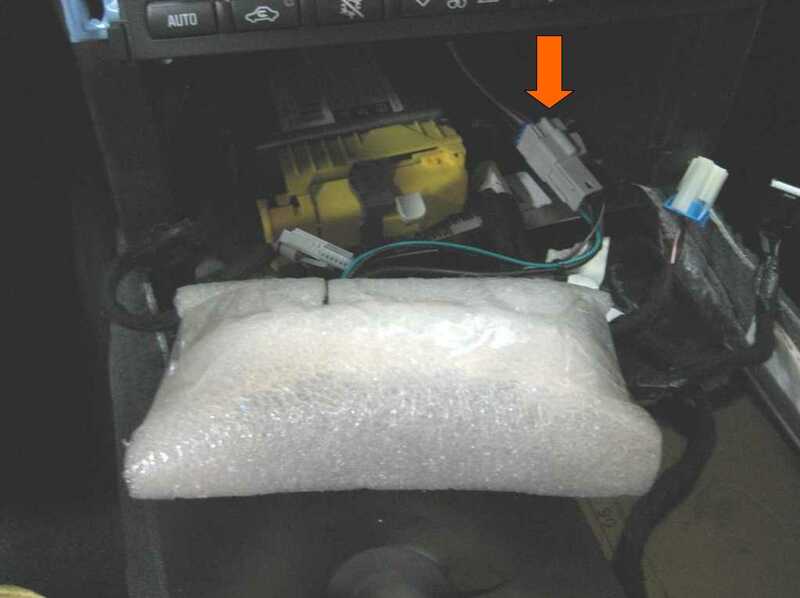 Note: One owner suggested that you remove the entire ashtray assembly from the console before removing the connector/lighter assembly. There are only 5 screws holding it in place. I didn't take mine out of the console first, but since it's simple to do, you can decide what is easier for you. The release tab is on the right in the photo, towards the ground when in the console. Push toward the wires to release it. Remember there are two of them. If you look closely at the hole on the bottom, third from right, you can see the part of the terminal where the locking tab is. You'll want to insert your jeweler's screwdriver into that hole and feel it go up the ramp of the locking tab. Then push towards the right of this photo to release the terminal. Connect the new switch using a custom NAV-2 adapter harness that is simply plugged in (cost $45 plus the switch). 1. 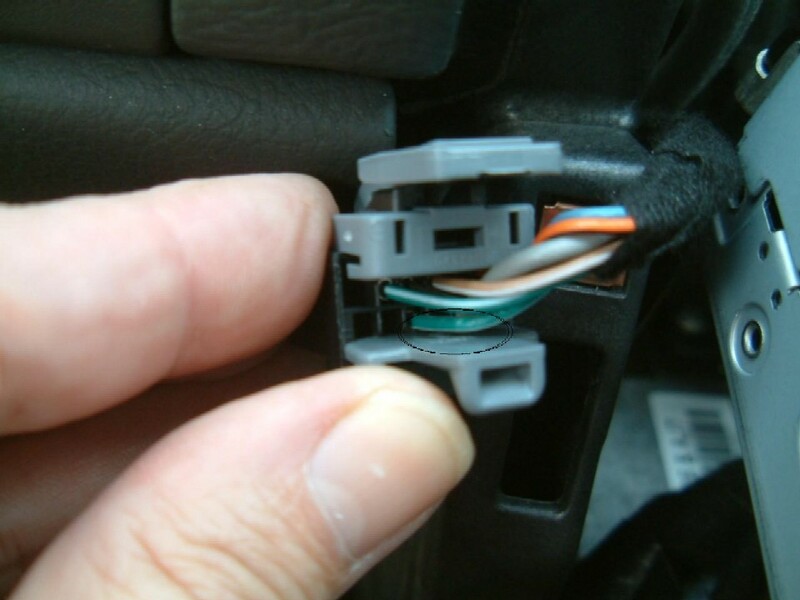 Unplug the 12 pin connector from the back of the Nav radio. 2. 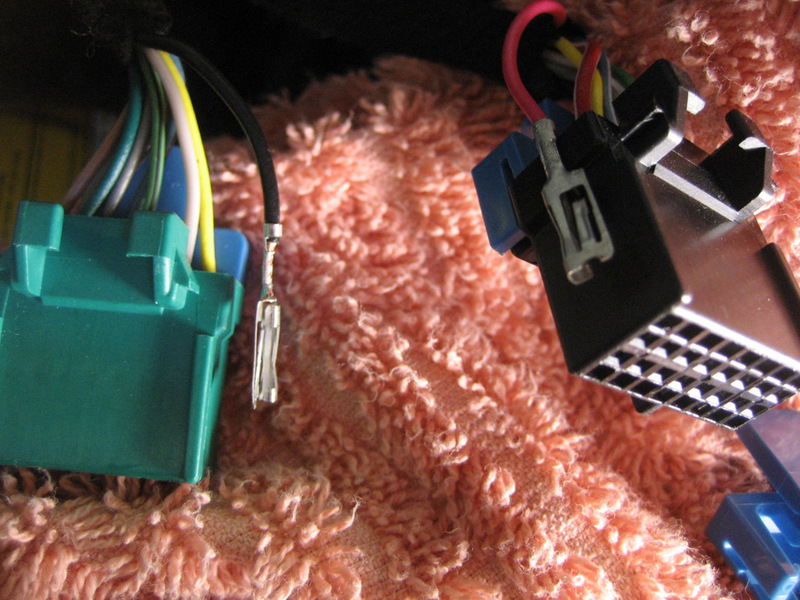 Plug that 12 pin connector into the mating connector on the harness (shown at left). 3. 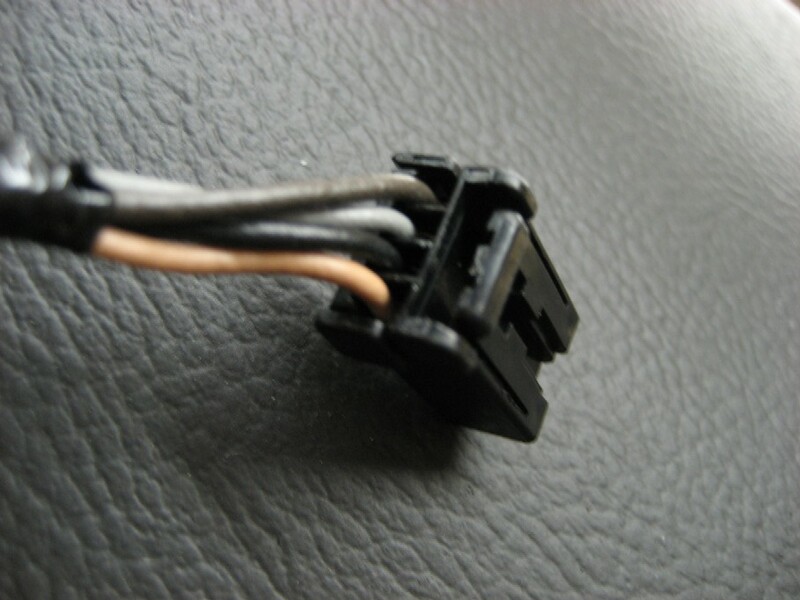 Plug the new 12 pin connector on the harness into the Nav radio (shown at right). 4. 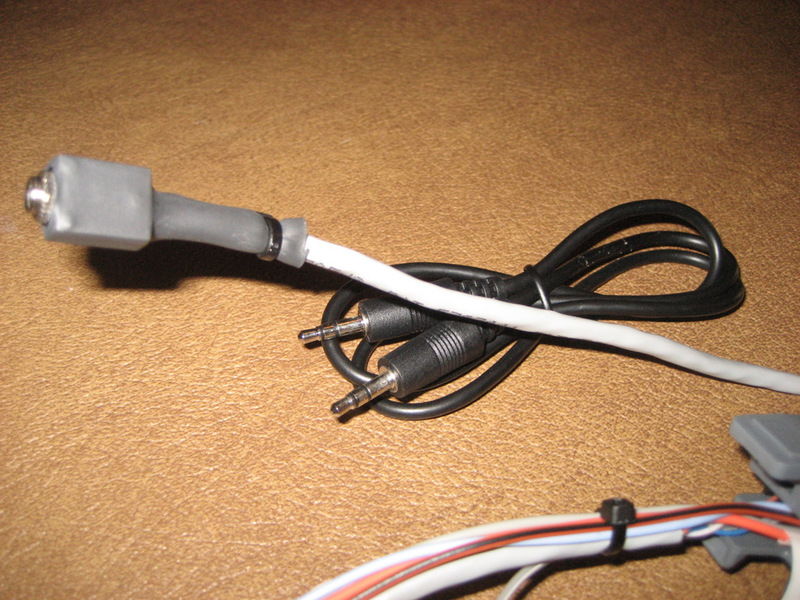 Connect your switch to the new wire pair shown in the photo. 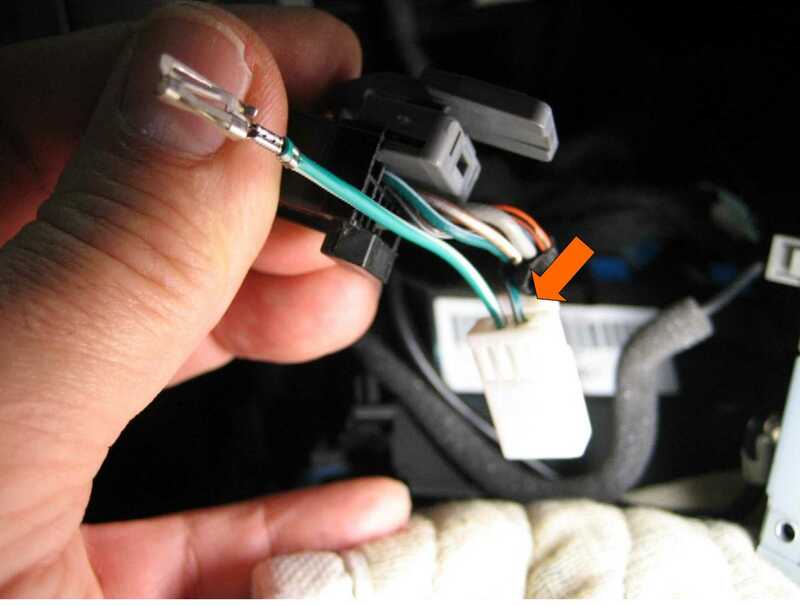 The above connector is the same Delphi 12064799 connector that is part of your factory wiring harness. 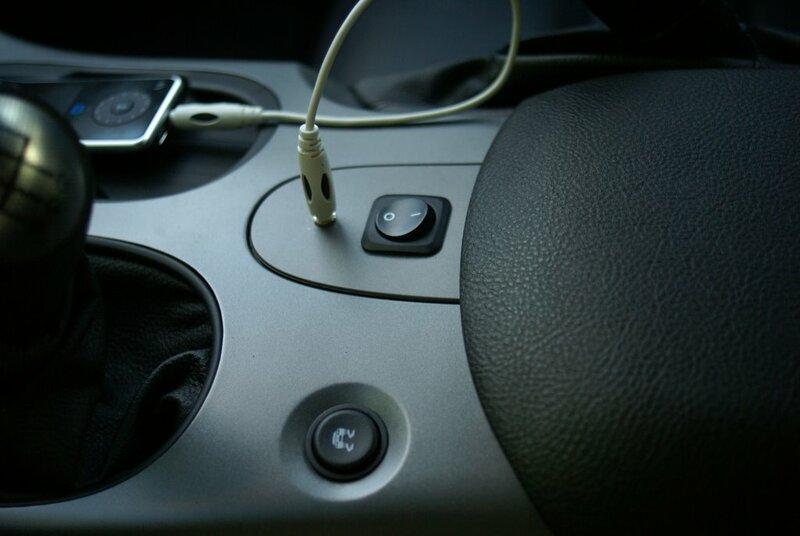 Same as Alternative 3, but Adding an Auxiliary Input to the Nav radio for connection of your music device. But take a closer look at Pins H, J, and K of that same connector above. Pins H, J, and K are the audio input wires from the XM receiver. By modifying the NAV-2 custom harness described in the previous section, we can intercept these audio signals and use them for an Auxiliary Input from another music device. 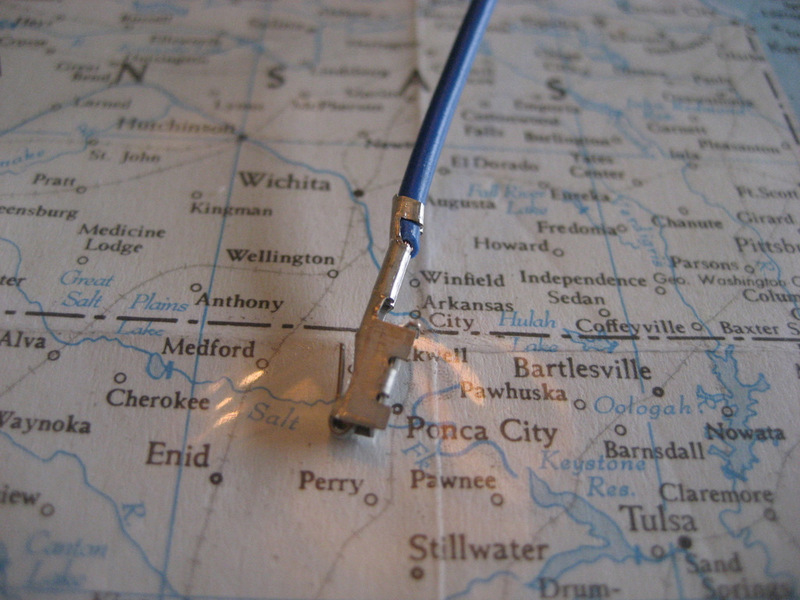 Most devices utilize a 3.5mm (1/8") jack on the device to connect speakers or an earphone. 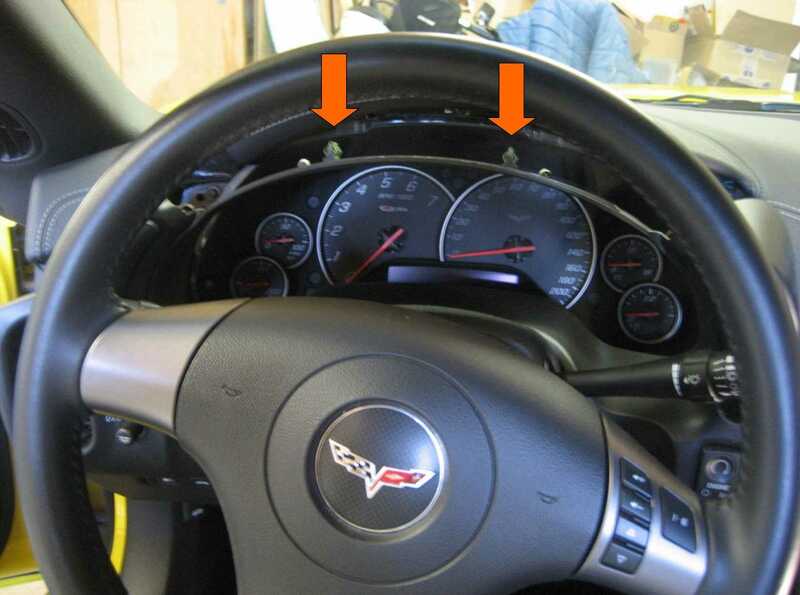 The latest C6 Corvettes have a built-in Auxiliary Input jack on the radio faces, but the Navigation radios still do not have an Auxiliary Input. 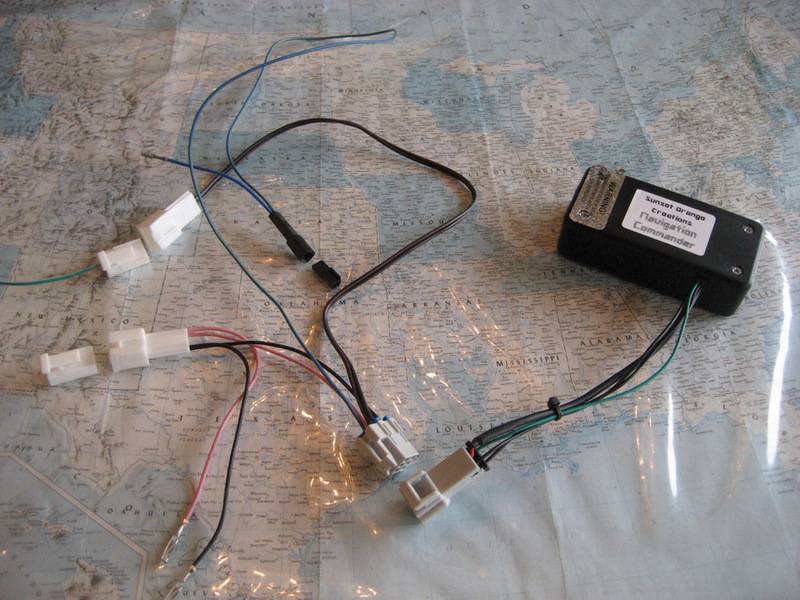 So we can add that Auxiliary Input to the Nav radios with this custom harness. 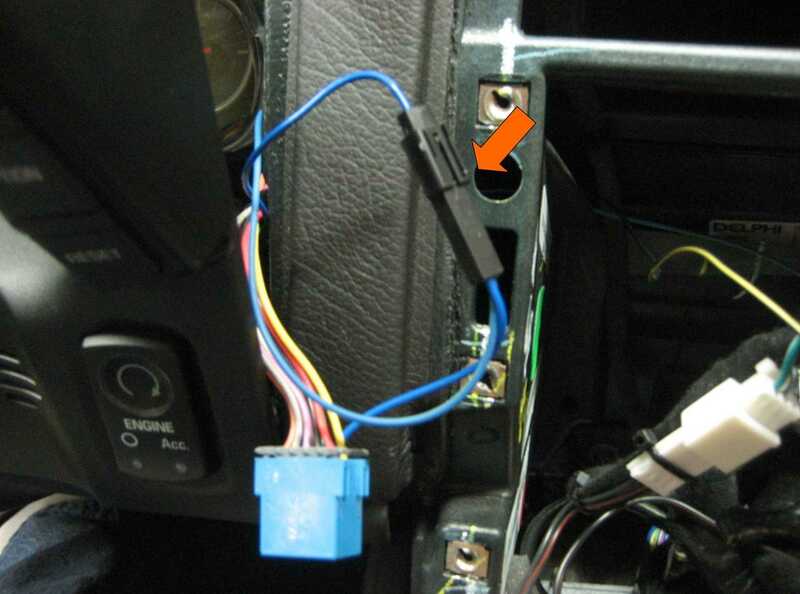 It still has the same wire for the speed sensor switch, but we can add a 3.5mm (1/8") jack that will disconnect the audio from the XM receiver when a 3.5mm stereo plug is inserted and connect your music device to the audio system instead of XM. 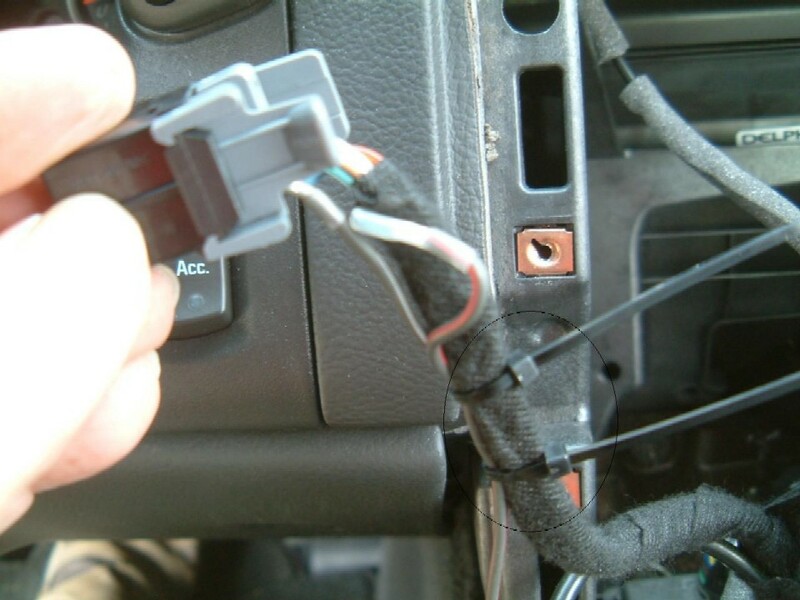 When you remove the plug, the jack reconnects the XM receiver audio. 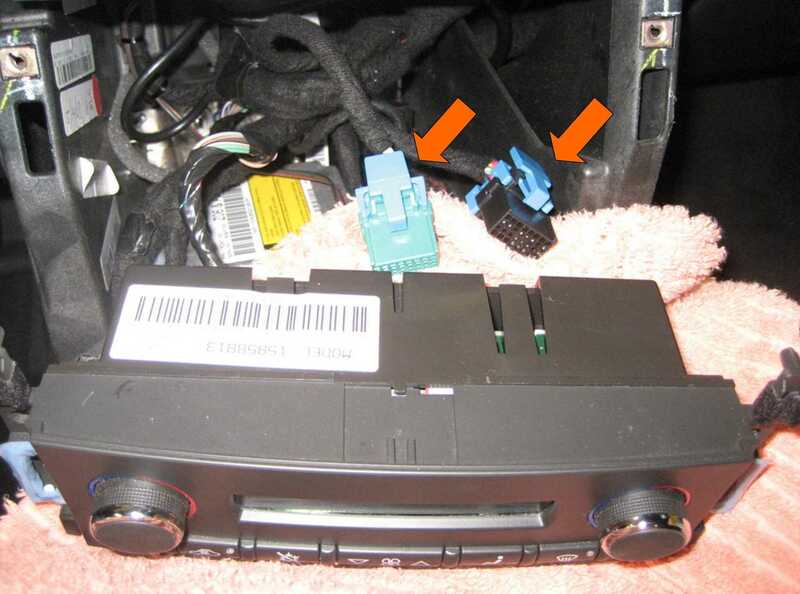 When a 3.5mm stereo plug is inserted into the jack, audio from the XM receiver is disconnected and audio from the plug is connected. 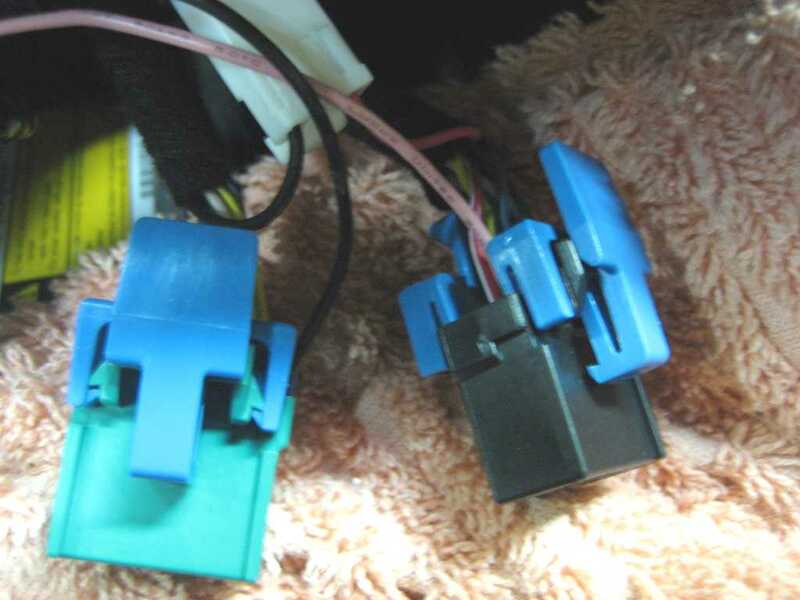 Here are additional closeup photos of the NAV-3 harness connectors. 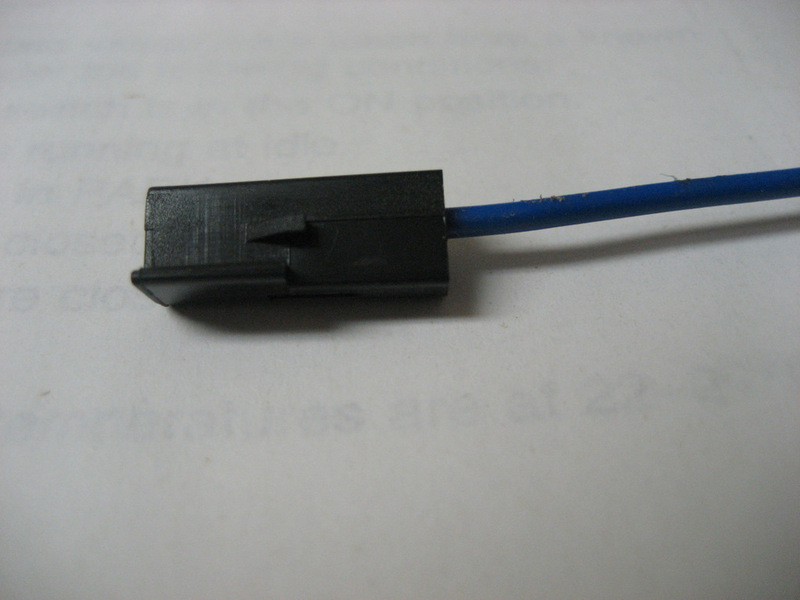 The soldered connections are under the heat shrink tubing. 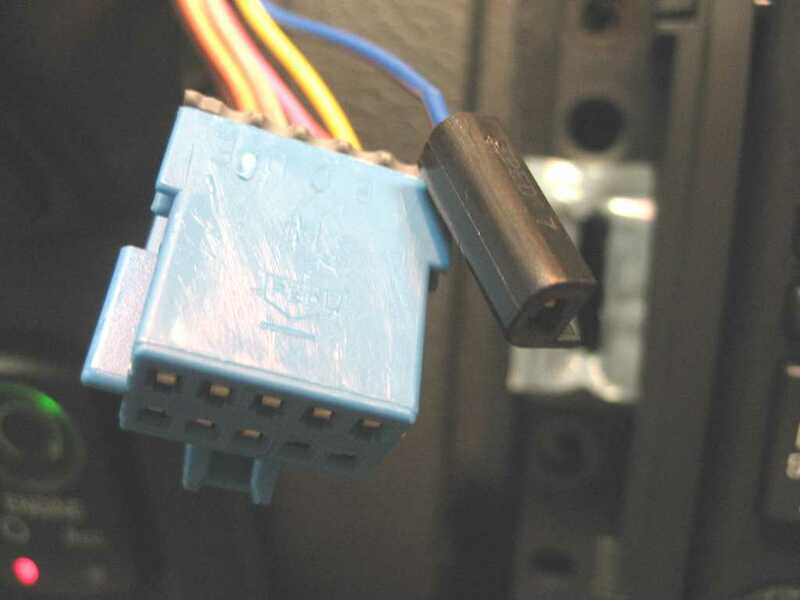 It is exactly the same Delphi connector as the OEM 12 pin radio connector, Delphi part number 12064799. The audio wires are in Pins H, J, and K in the above photo. 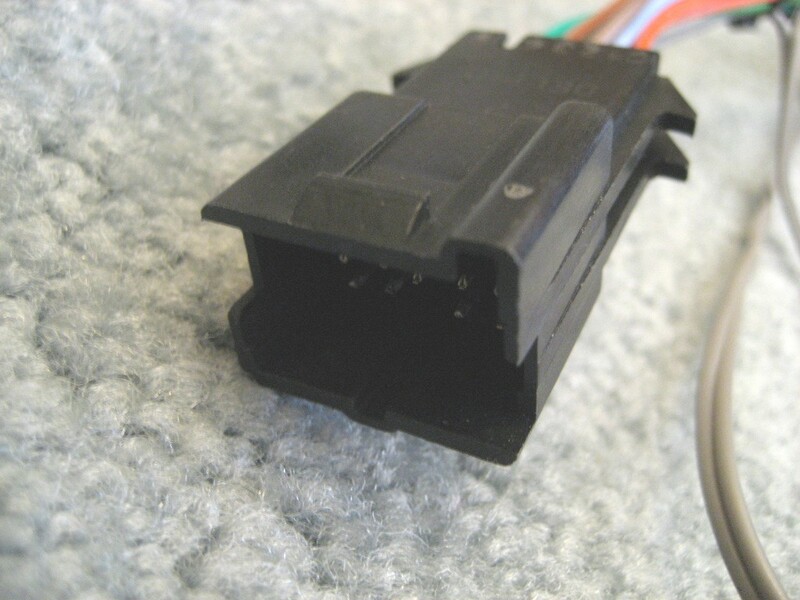 This is the same Delphi 15356627 connector used in the NAV-2 harness. Note the audio wires in Pins H, J, and K (positions C3, 4, and 5 on the connector). 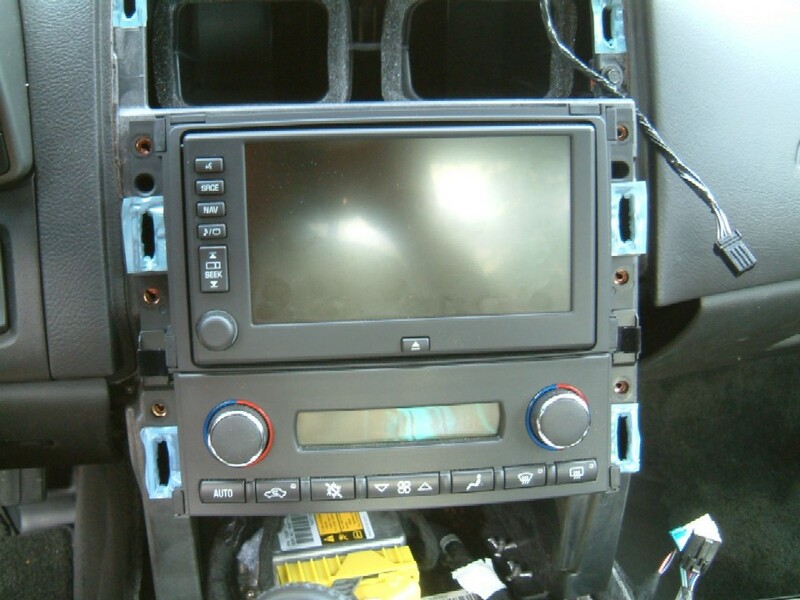 On the left, above, is the Aux In jack mounted in the console. All you need is a 1/4" hole. 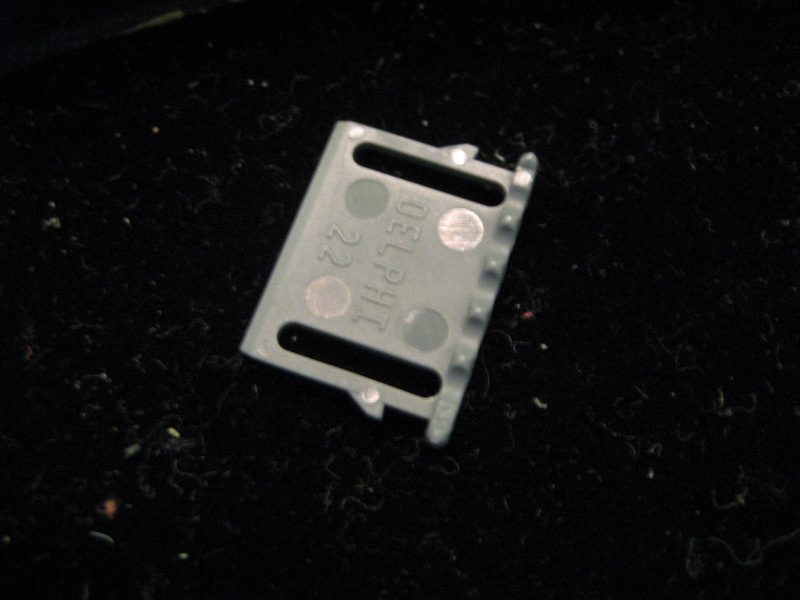 But note that the threads on the jack are pretty short and the jack is really made for a panel about 1/8" thick. Les used a Dremel tool to grind a bit of the console to make it a little thinner so the jack would fit. 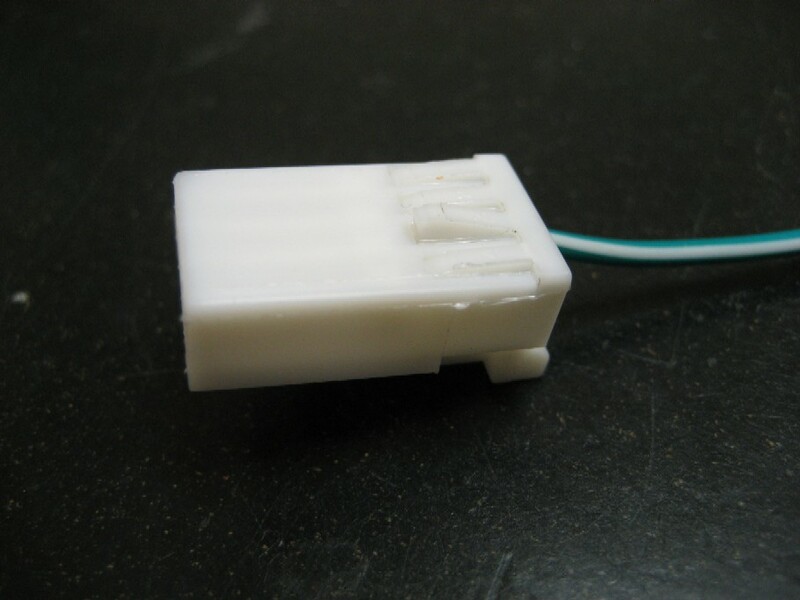 He also used a Dremel tool to grind away a bit of plastic to make the jack fit the panel. He used a 15/64" drill bit. 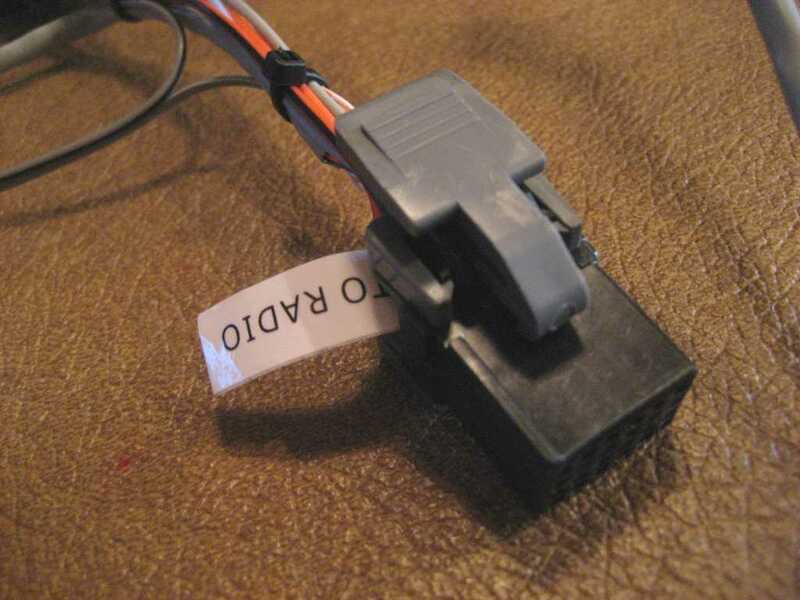 You can make your own harness using the instructions above and the .pdf file for the jack if you choose the NAV-3 design. 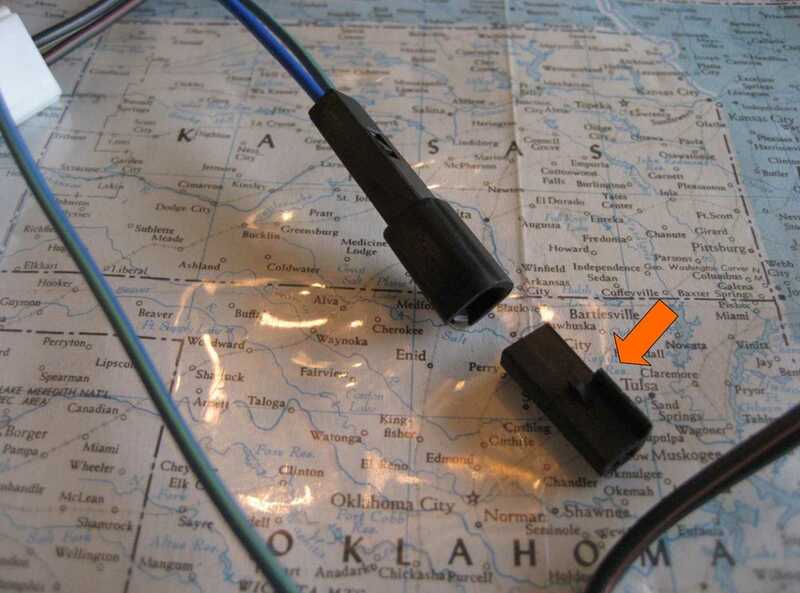 But the connectors and terminals are often hard to find. 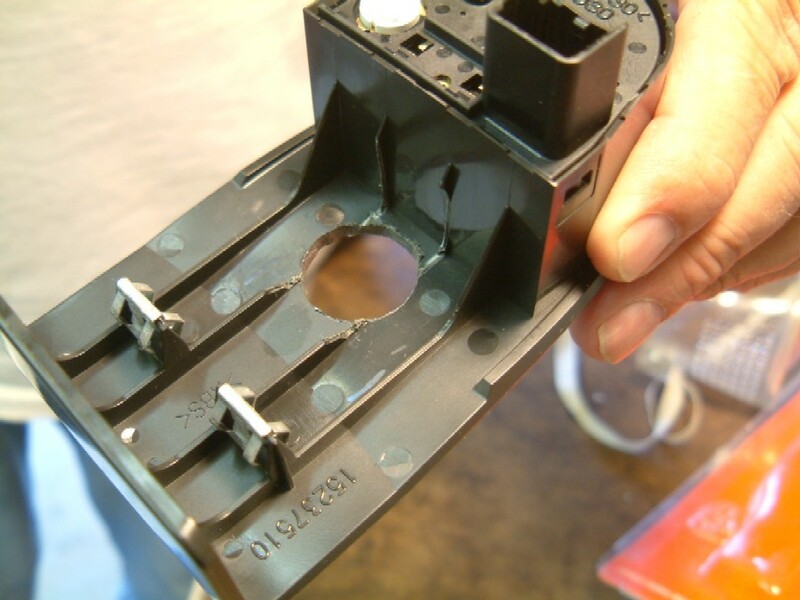 To install the terminals, you will need a crimp tool. If you don't have one, click here for a suggested tool from Ballenger Motor Sports. If you prefer, I can make you a complete harness of your choice. 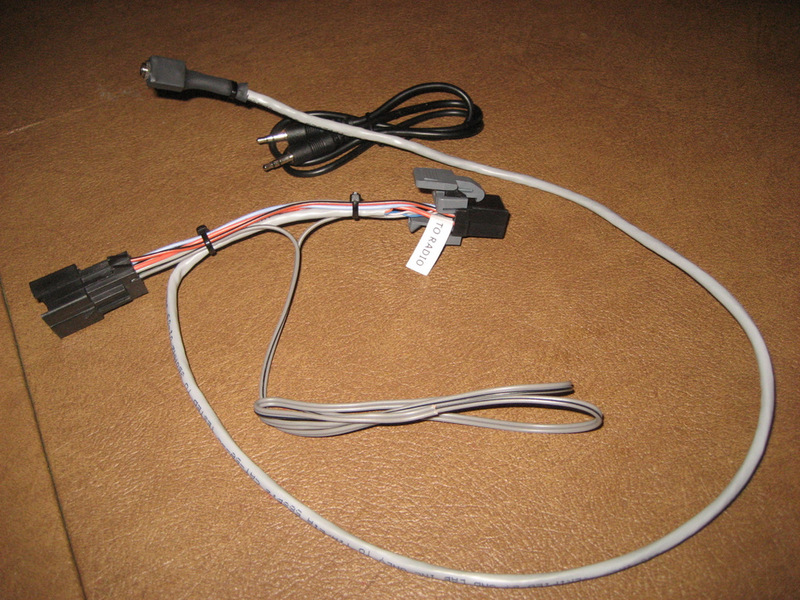 The simple NAV-1 harness is $25 including shipping, because it is so light and easy to mail. 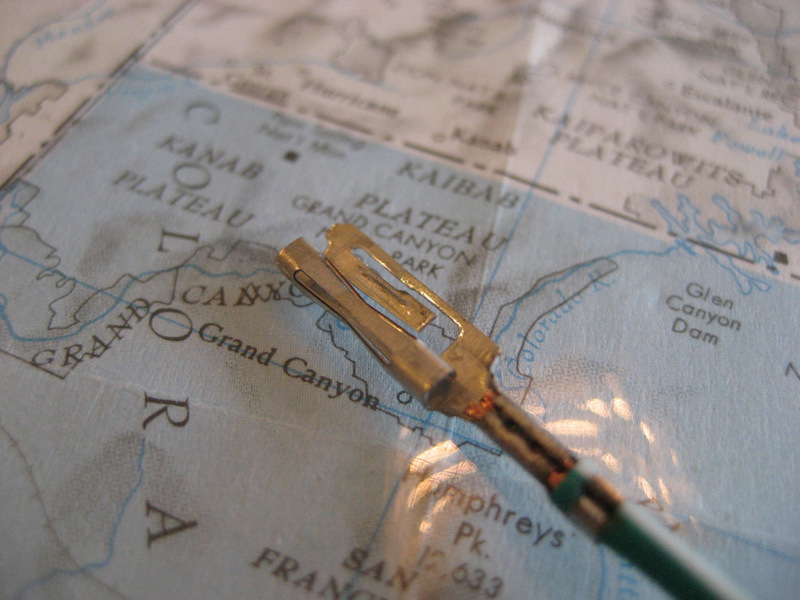 The NAV-2 harness is $45, but you'll need to add $5 for Priority Mail shipping because it requires a small flat rate box. 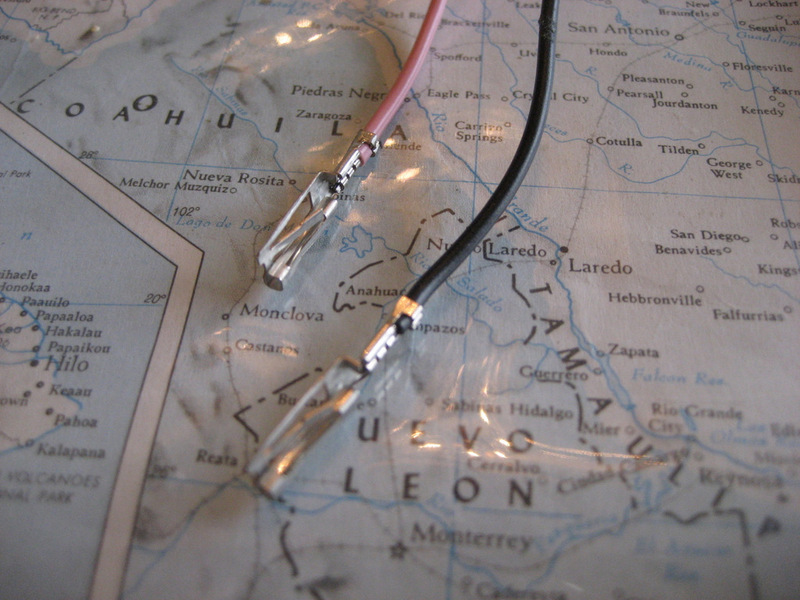 The NAV-3 harness is much more time consuming to make because of the soldering and additional wiring. So I'll need $90 plus $5 Priority Mail shipping if you choose that route. 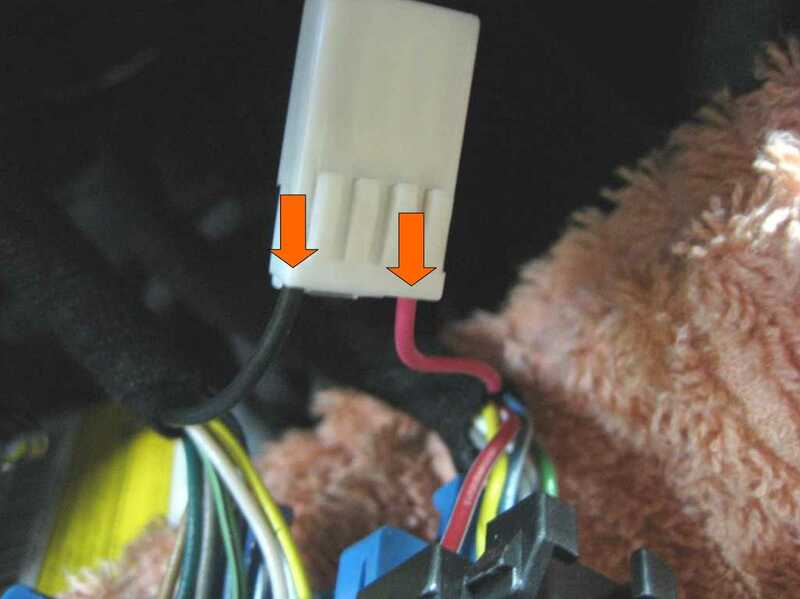 Remember that these harnesses do not include the switch for the speed sensor disconnection because you'll need to choose your own switch and location for the switch. 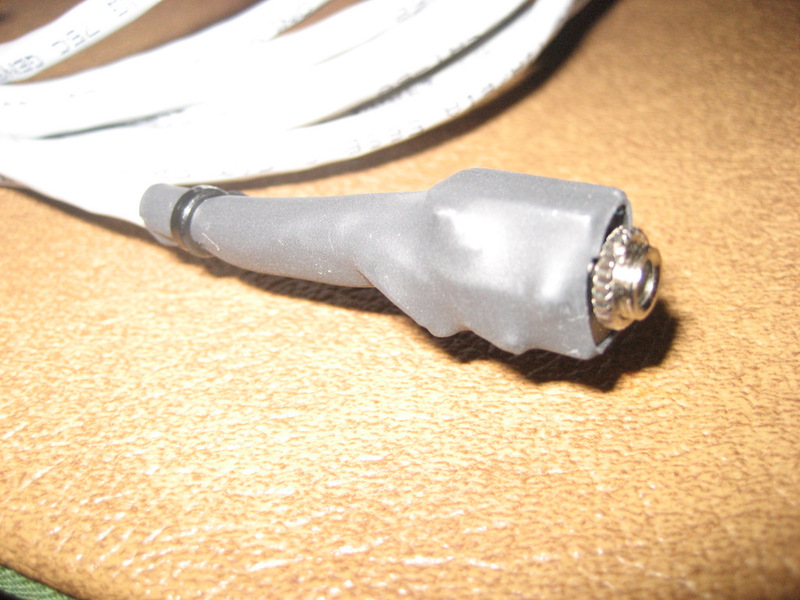 The NAV-3 harness does include a 2' patch cable to connect your music device. I also have 6' patch cables if you would prefer the longer length. You can email me at ray@kawal.net if you have any questions about this installation or would like to order a harness. Install Ben Stanley's Sunset Orange Creations Navigation Commander (see Ben's site for cost). 1. A new switch is not necessary. 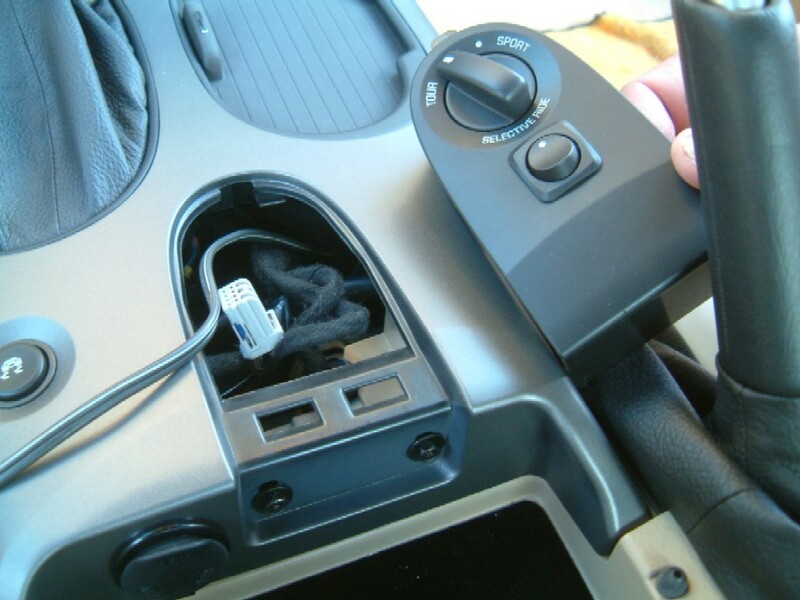 Instead, the Commander circuitry allows you to use the TRIP button on your DIC to switch out the speed sensor signal to the Nav unit. This makes the installation look completely "factory". 2. As noted in the discussion of Alternative 1, when you switch out the speed sensor signal, you have a limited time to enter destinations before the Nav unit "figures you out". What happens is although the speed sensor signal is switched off, the GPS eventually tells the Nav unit that you have indeed moved - so you again lose your destination screen. 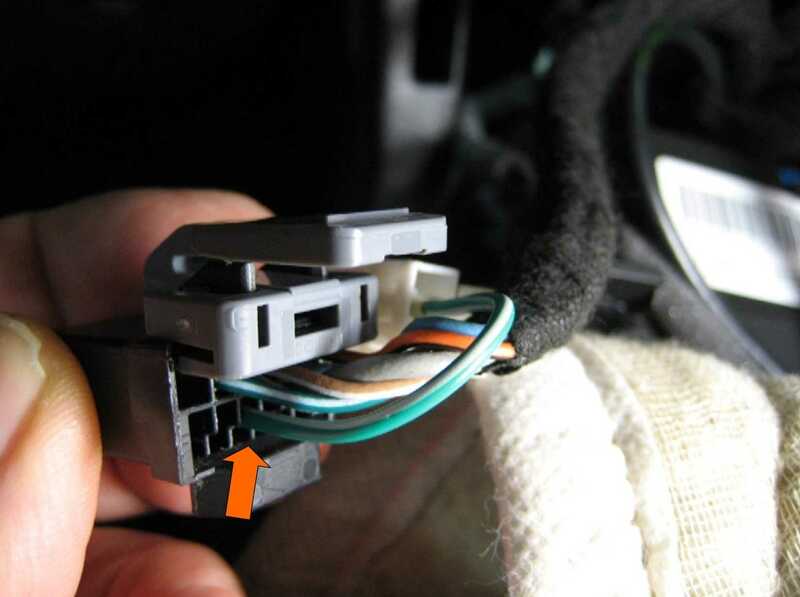 With the "switch alternatives" described above, if you run out of time, you have to switch back to "normal" until the screen blinks, then again switch out the speed sensor signal. Depending how much time you have taken to enter your destination, this may or may not be an "irritation" for you. With Ben's Navigation Commander, his circuitry automatically switches the speed sensor signal back in after about 30 secs, then out again, and repeats that until you have entered your destination. It works pretty nicely. This Alternative shows a method of installing the Nav Commander that Ben may or may not incorporate into his package. I prefer it because it uses factory type Delphi connectors and you don't have to get into the fuse block area to add piggyback type fuses. 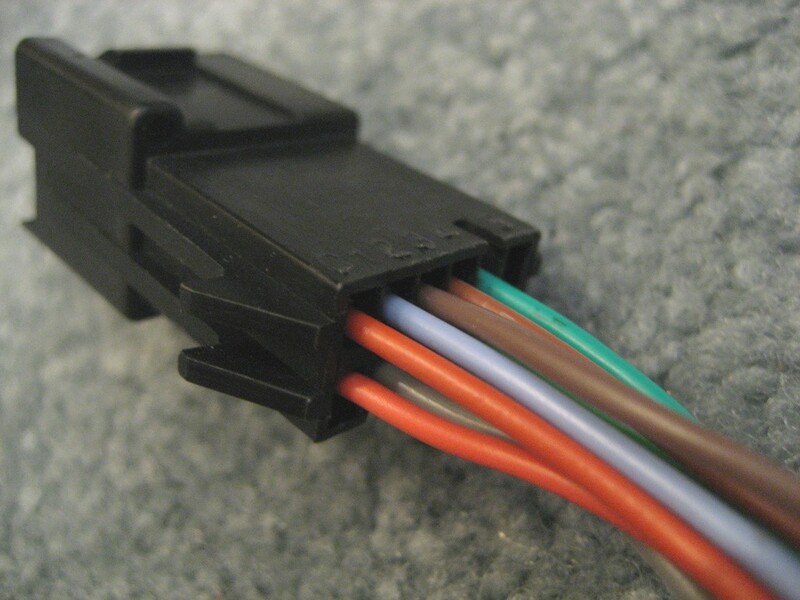 These connectors are solid, factory quality connections that are well integrated into the factory wiring harnesses. 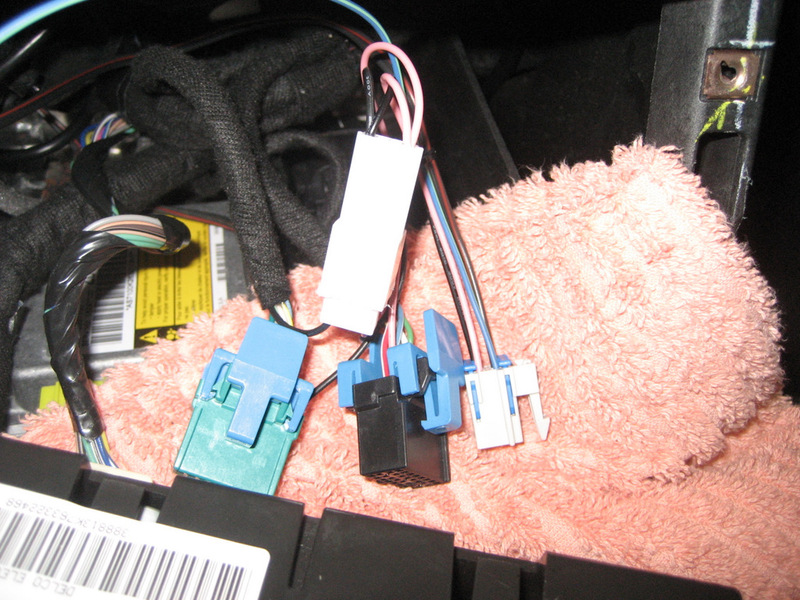 A. Ignition and Ground wires (pink and black) into the HVAC (heater controls) connectors. B. 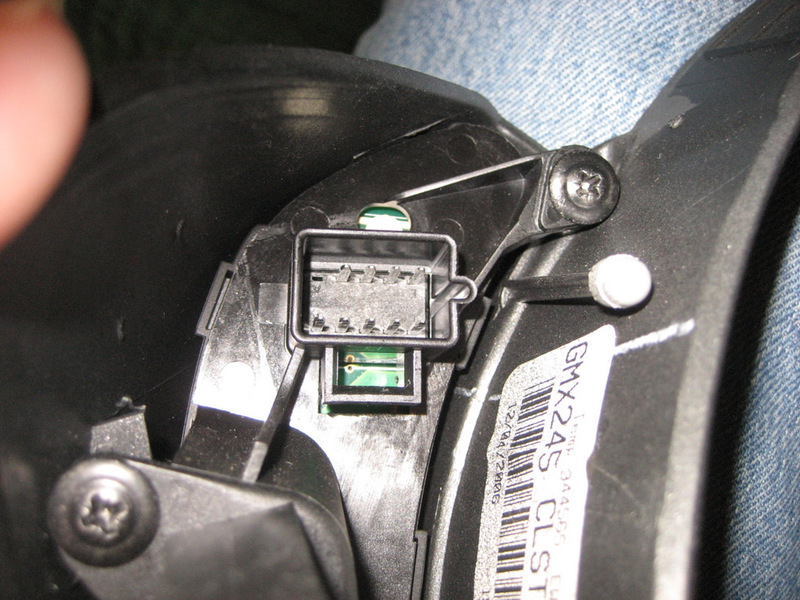 Two wires into the speed sensor terminal of the 12 pin Nav Unit connector. 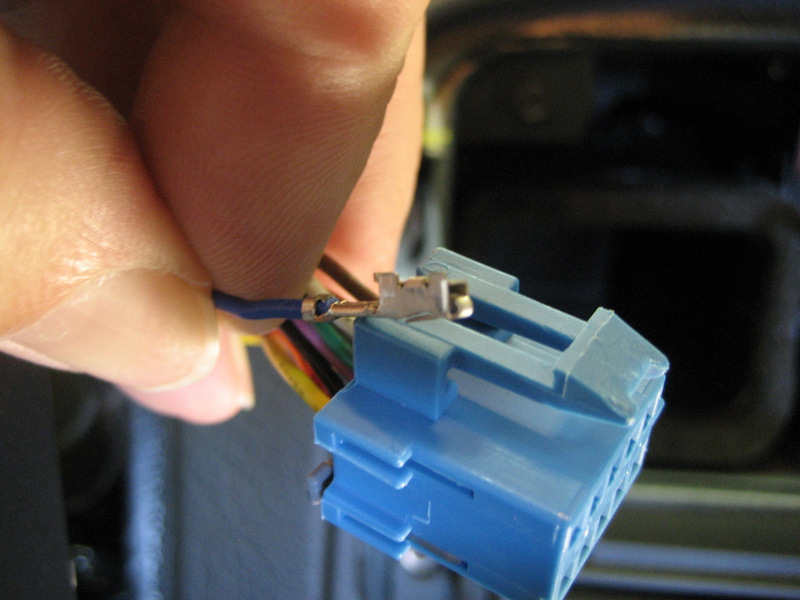 C. One blue wire into the Driver Information Center switch connector. 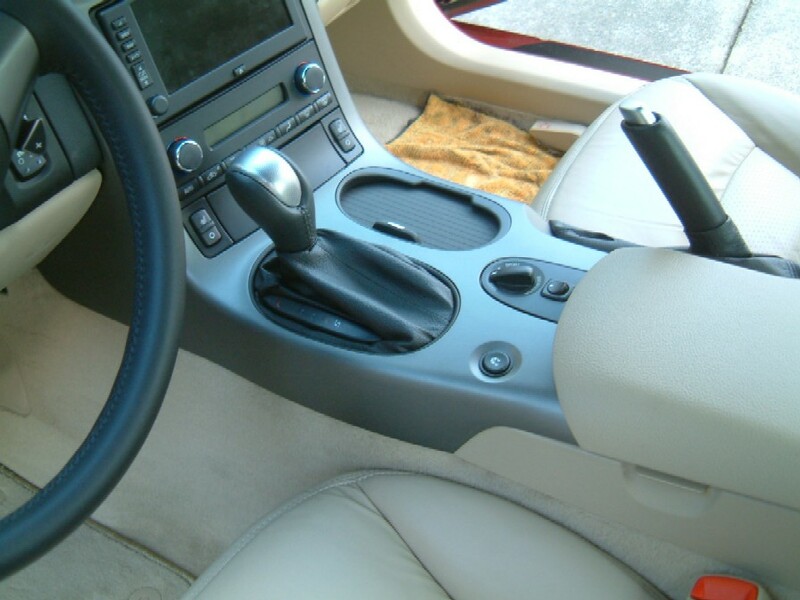 To get started, first remove the center console. Then remove the two 7mm screws holding the HVAC controls in place. 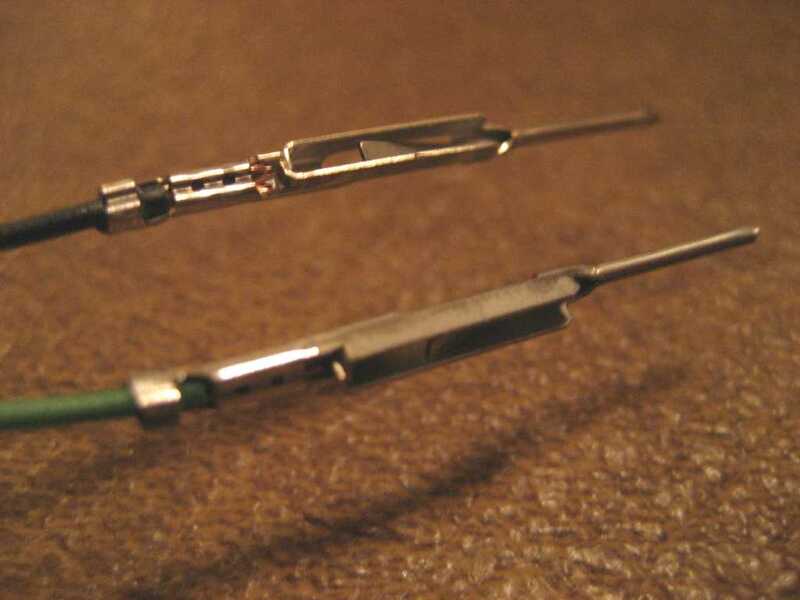 Examine the two connectors. We want to remove two terminals, one from each connector. The middle 16 holes are where the terminals make their electrical connections. 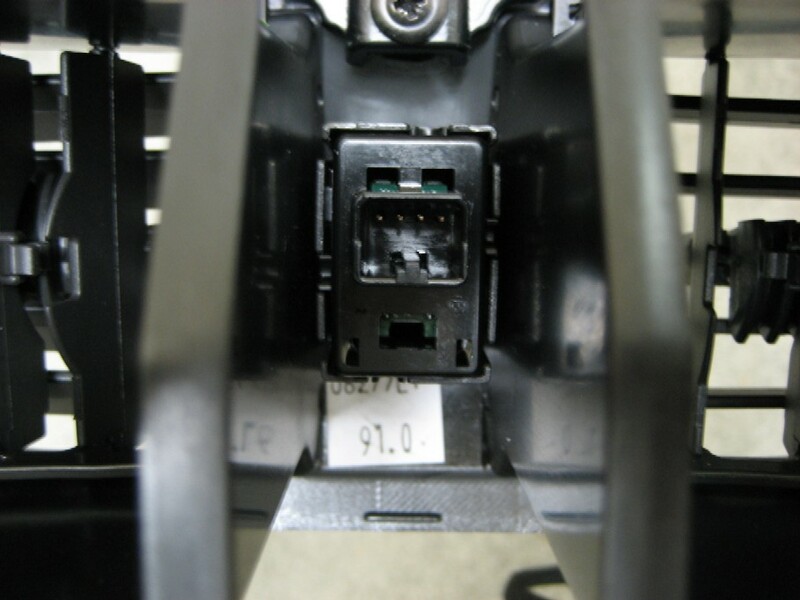 The terminal installs in the connector sideways, with the locking tab above the square connection surface..
Push to the left and this will release the terminal. then push left to release the terminal. 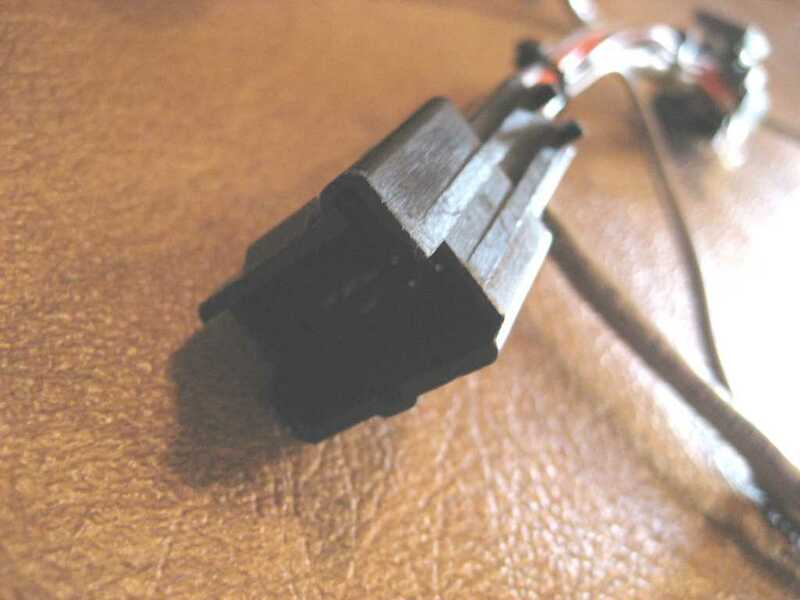 In the other (black) connector, we want to remove the pink Ignition wire from position A7. In order to remove these terminals, we must first remove the TPAs (for Terminal Protection Assurance). 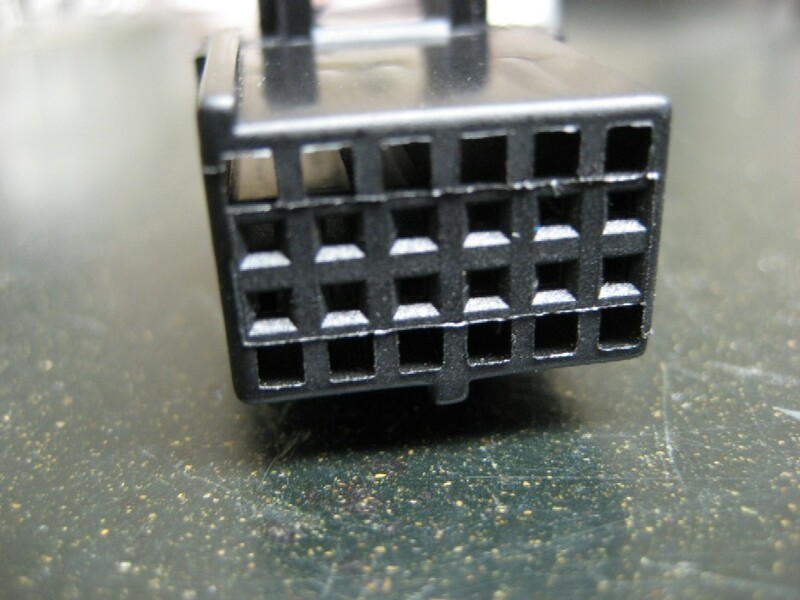 There are two TPAs on each connector. You only need to remove the top ones. Push the four locking tabs to hold the terminals in place. 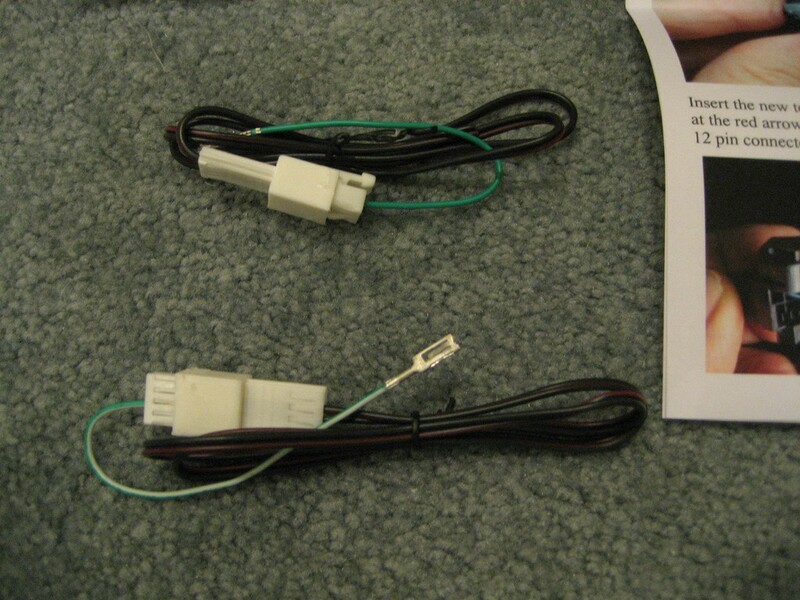 On the left is the connector you just attached to the two original Ground and Ignition terminals. 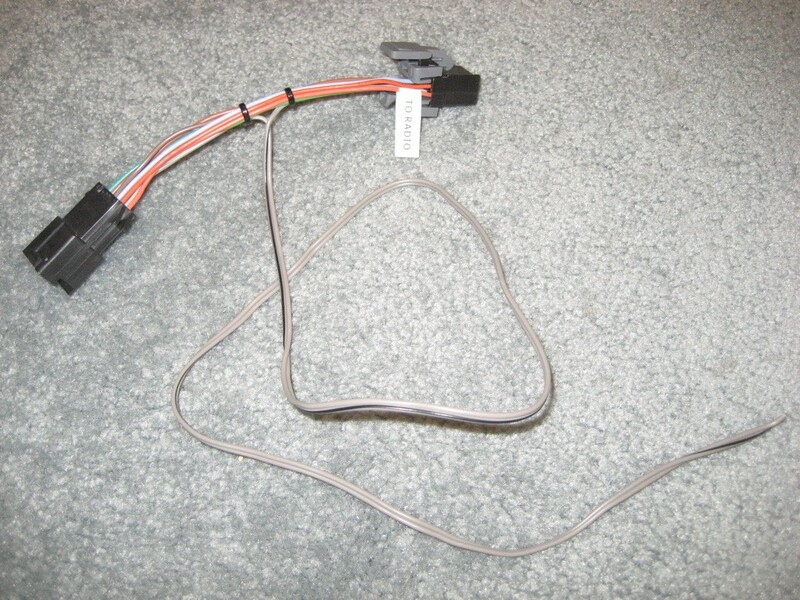 On the right is the connector attached to the harness. 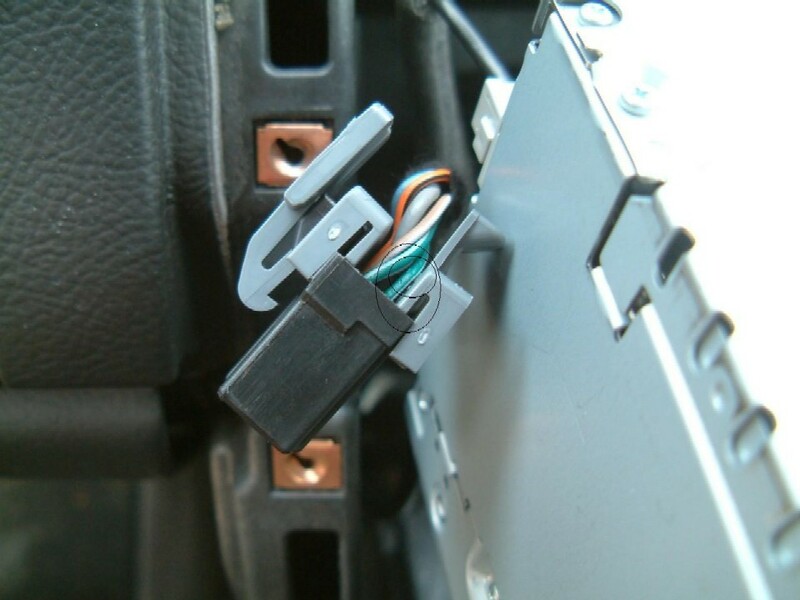 See the two new Ground and Ignition wires? 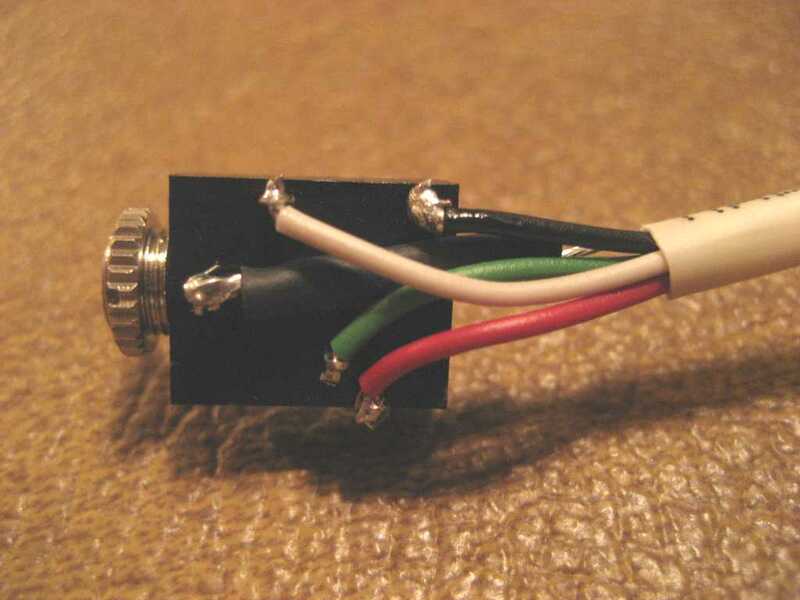 This provides a Ground and Ignition connection to the new Nav Commander harness. Closely examine what you have done. 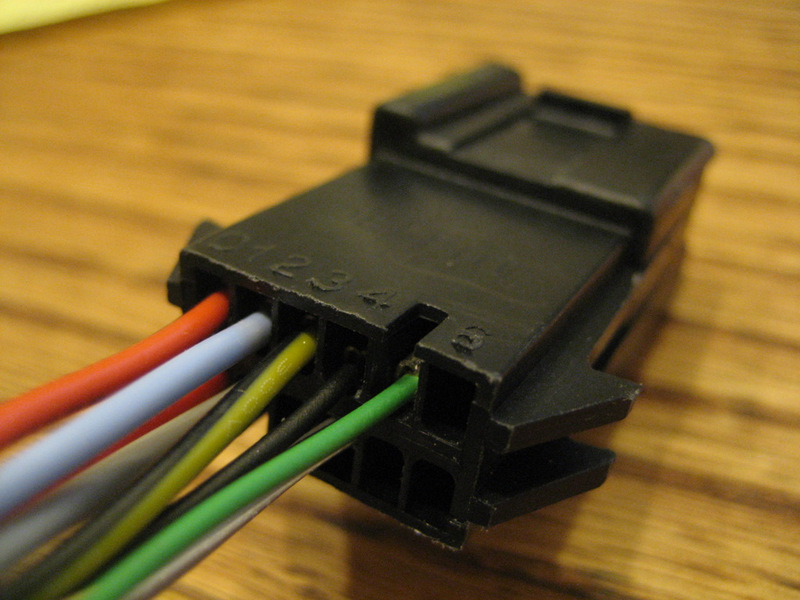 BE SURE the pink and black wires are in the correct positions in all of the connectors. 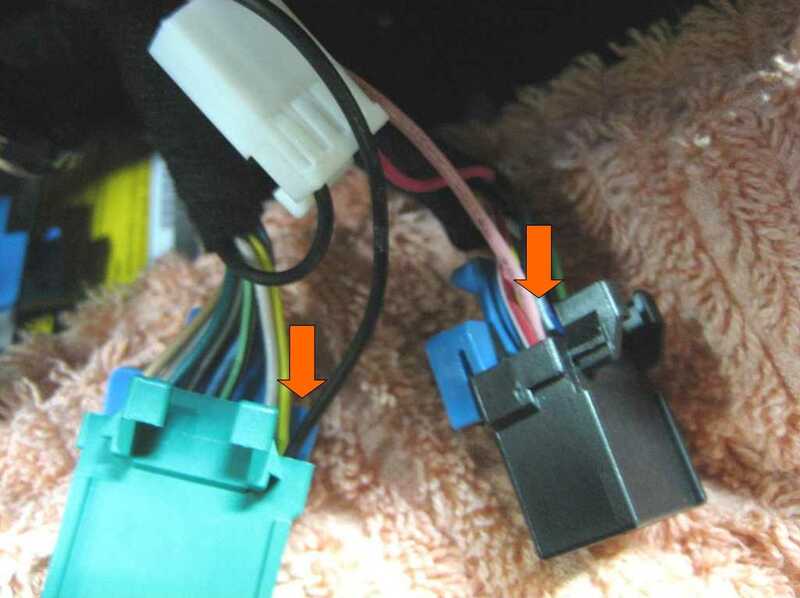 The pink wires must connect with the pink wires and the black wires must connect with the black wires. 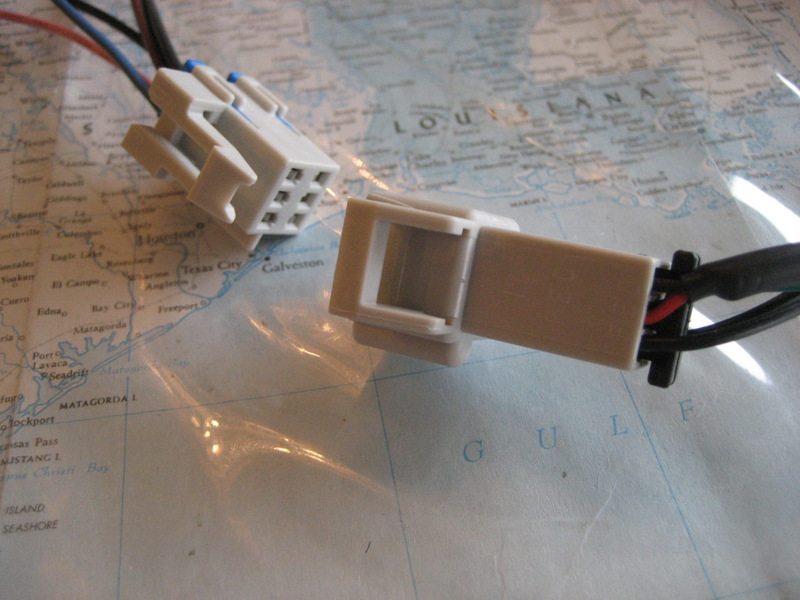 This leaves the remaining white connector and the blue DIC wire to be connected. Set a soft cloth over the HVAC module and pull out the Nav Unit after removing the four 7mm screws. 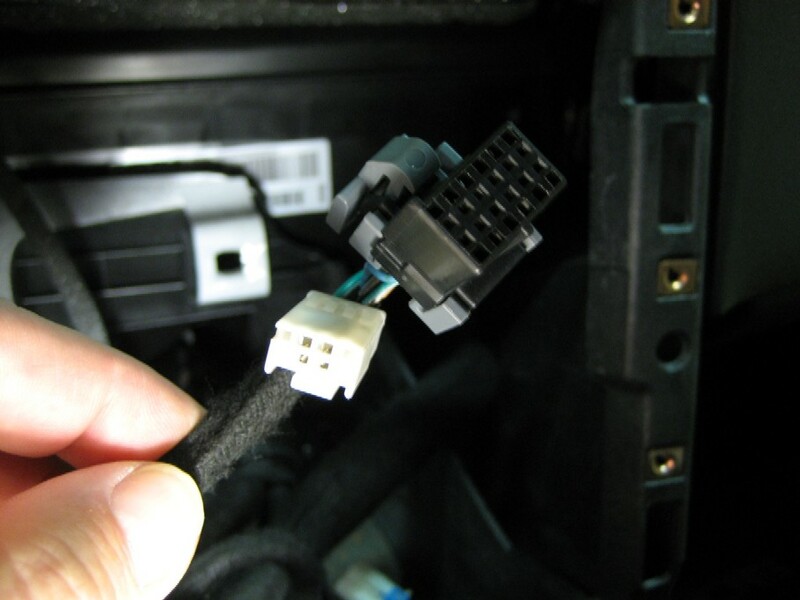 Remove the 12 pin connector by squeezing the tabs, just like you did with the green and black connectors on the HVAC. 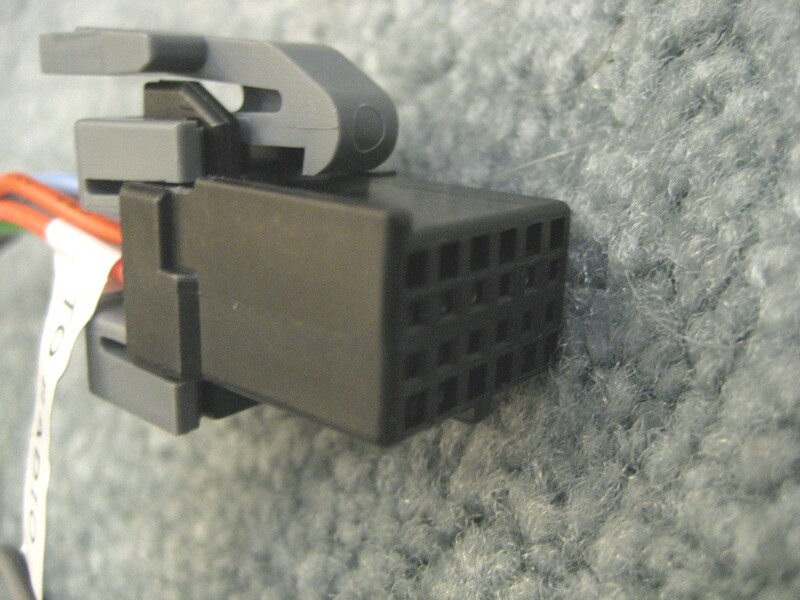 This is the same Delphi Micro Pack 100 terminal and connector series as the HVAC module connectors. OK, only one wire to go! With the Nav Unit still removed, pull out the Instrument Cluster Bezel. It's usually easiest to grab near the lower left and pull that section out first, but you can also grab the top sections and pull. See the locking tab at the bottom? 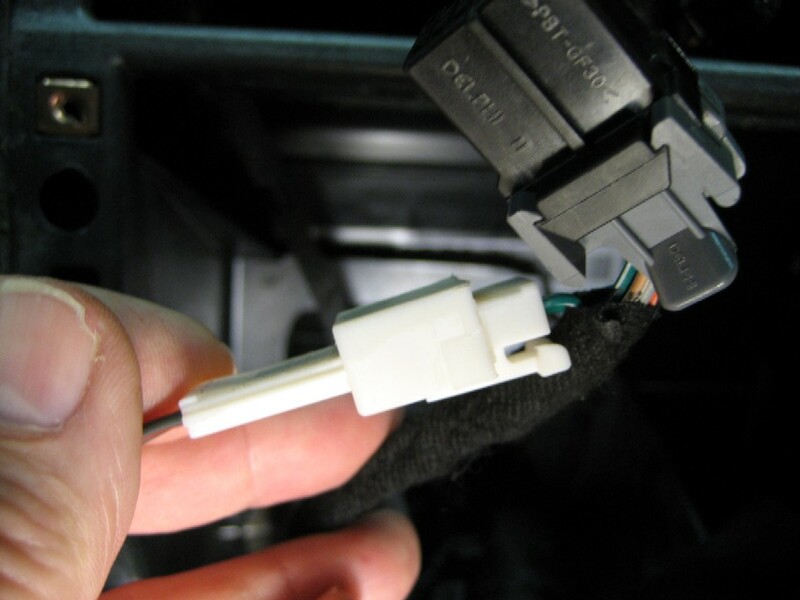 To remove the connector, you must push up to release the locking tab. plus, you can't see back there when you are behind the steering wheel. So it's easiest just to remove the switch from the bezel. You can see two of the three screws in the previous photo. 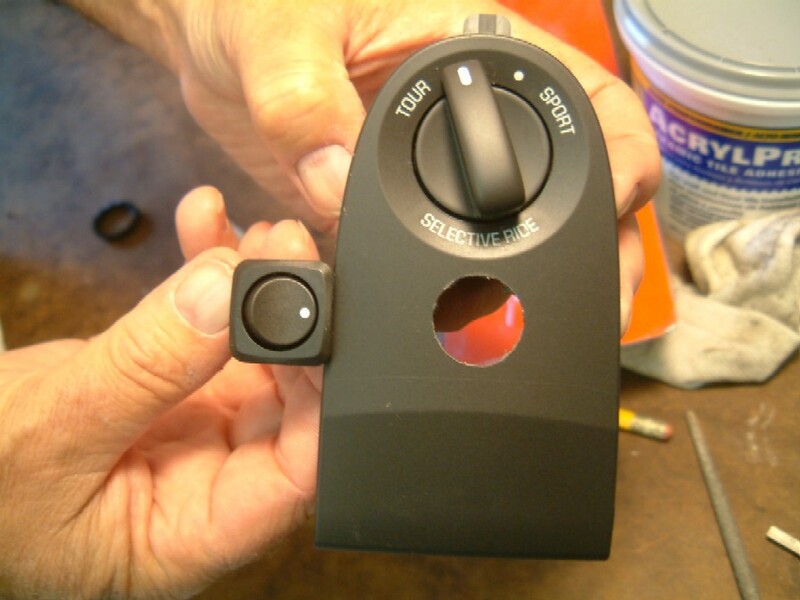 With a short Phillips screwdriver you can easily remove the DIC switch assembly from the bezel. Then remove the connector and reinstall the DIC switch in the bezel. See the blue wire in Position J? We want to remove it. 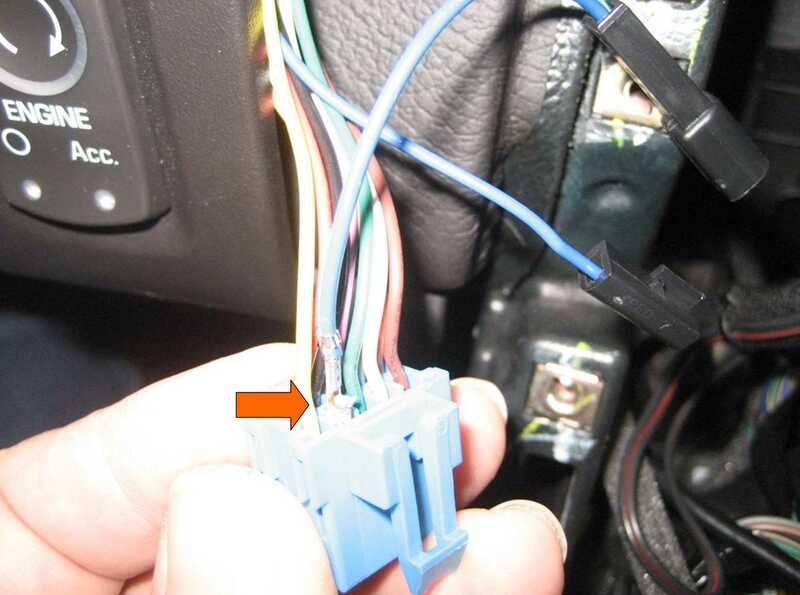 You only need to remove the TPA near the blue wire. This will allow the terminal tang to be released. 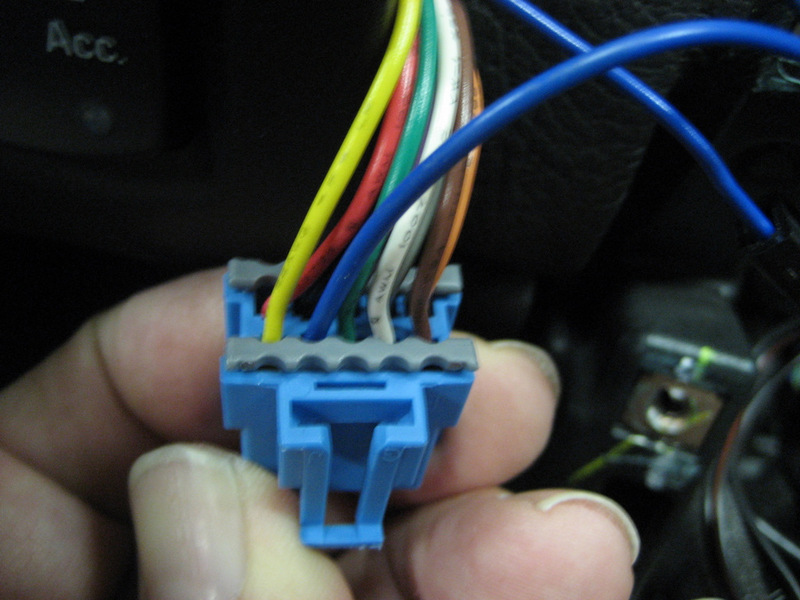 Next, route the new DIC blue wire from the harness behind the Nav Unit and into the instrument cluster cavity. See the new DIC terminal on the new blue wire in the upper left? 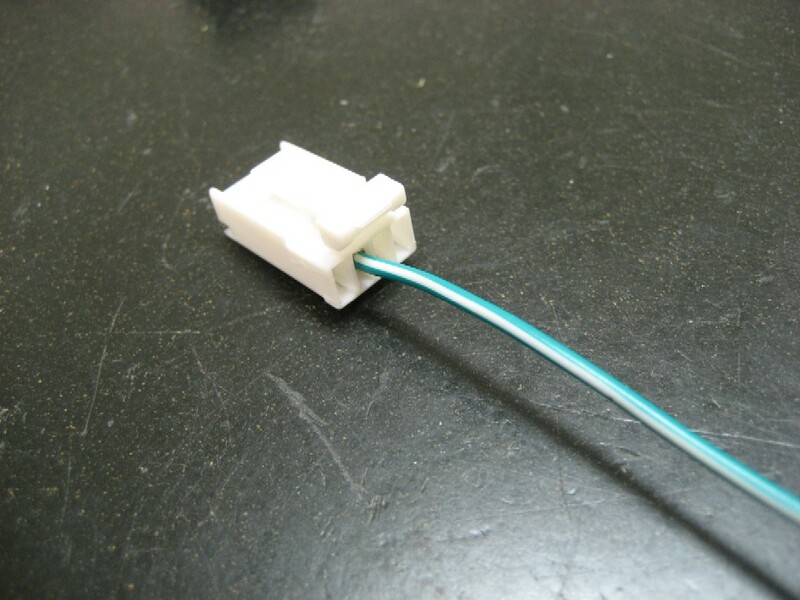 Use a tie strap to make a neat wire bundle, then plug the DIC connector back into the DIC switch. Reinstall the Instrument Cluster Bezel by pushing it in place. The wiring connections are now complete, except for plugging in the Nav Commander. Reinstall the HVAC module with the two 7mm screws. At this point, you might want to try out the Nav Commander to make sure everything is working properly before you reinstall the center console. Take a slow drive, turn on the Nav, and try to enter a destination. You should see the destination screen is blanked out whenever you are moving more than 5 mph. As you are moving, push the DIC TRIP button for a second or two. This should bring the Destination Screen to life, allowing you to enter destinations. You have about 30 seconds or so, then the screen will go blank again for a few seconds, then light up again for you to continue. When you are finished entering your destination, again push the DIC TRIP button for a couple of seconds to place the Nav Unit back in Normal position. If you do not place the Nav Unit back to Normal, it will not track properly and you lose the Time to Destination function. So always place it back while driving. Once you are satisfied with the Nav Commander's operation, reinstall the center console.